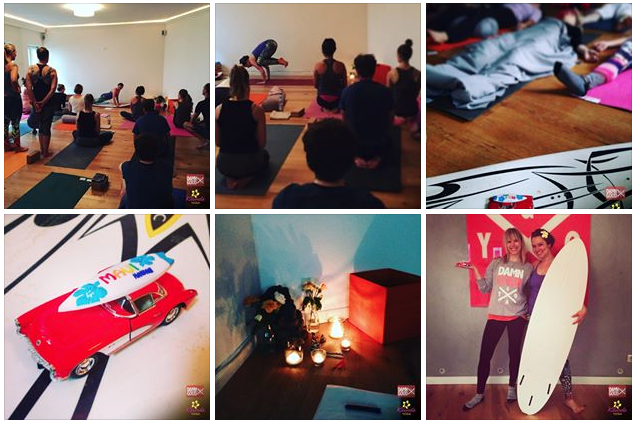 Yoga & Film go together. In Yoga, we work a lot with developing our mind and refining our ability to see and empath. We use upside down poses to touch on our fears, work through them and dissolve them, so we are not trapped by them anymore, and also to flush our sinovial fluids to refresh our brain. Changing perspective by going upside down also helps to downregulate our nervous system and put things in perspective, as thoughts / ideas / issues that do our head in suddenly don’t get the same weight. The change of angle helps to perceive situations differently. Obviously, this is a priceless asset for me when I create a film or any kind of content, as a good piece of visual communication must be #interesting, #beautiful, #inspiring and tell me something #new, show me something I did not know or perceive like that before. Because (one of my favourite quotes) “The real journey of discovery is not seeing new landscapes, but having new eyes.” – Marcel Proust. Yoga is the art of exploring the edges inside and melting the limitations within. 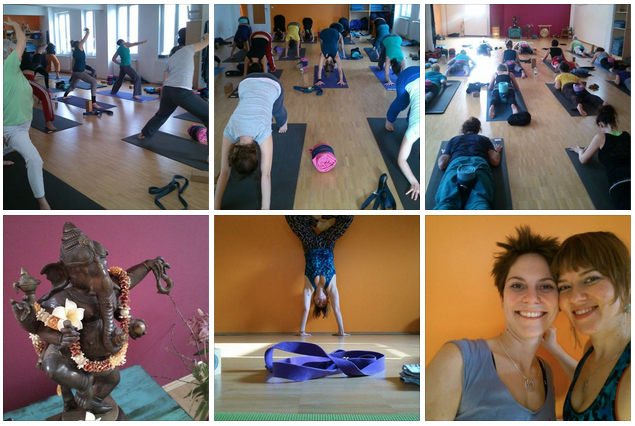 Thank you, Die Yoga Station for another beautiful workshop : : : “Gravity Surfing” – what a ride!! Learning it is not always strength that gets you there, but the intelligent use of gravity, technicality, breath and awareness, and how to spread little strength to different parts of your body to float like a butterfly and be free like a bee. If you’d like to exercise connecting with your inner strength, and learning to breathe in a way that empowers you and makes you free, come and join me in #Lamu soon! 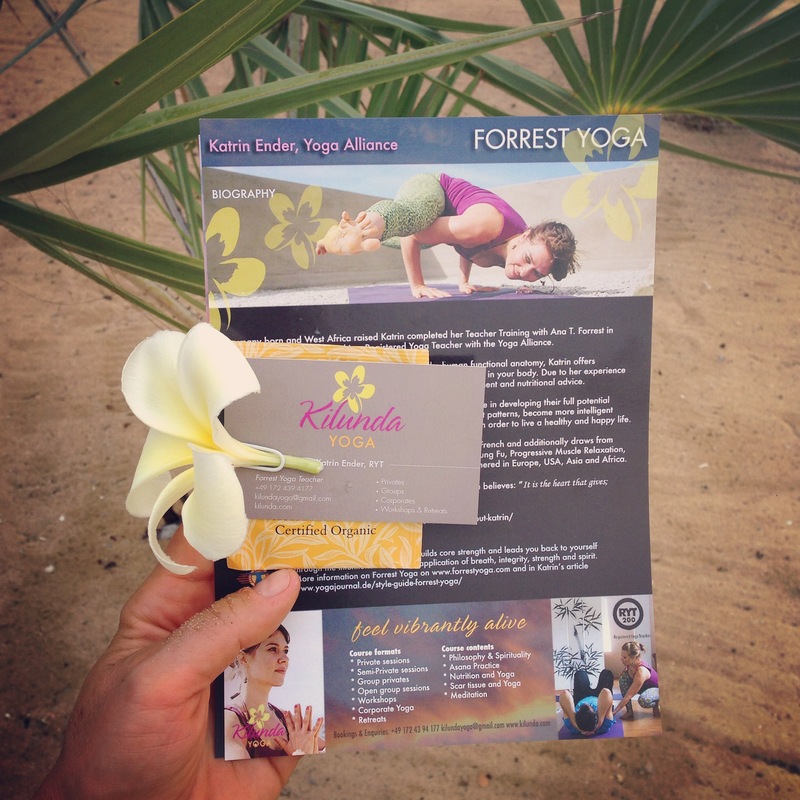 Next opportunity to practice Forrest Yoga with me: Lamu Yoga Festival following my #ForrestYogaSpeakYourTruthRetreat from March 15 – 19, 2017 at Banana House and Wellness Centre. Yoga is the art of expanding within oneself, creating space internally and thus creating space in one’s own life. 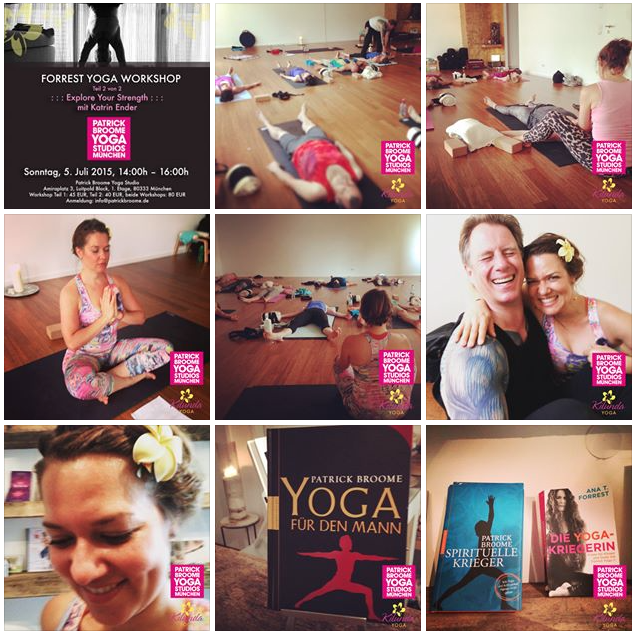 Thank you, Die Yoga Station for another beautiful workshop : : : “Riding Intensity Waves” – as always, what a trip!! The best present is presence. And the connection to one’s own strength and loving heart. Be inspired. 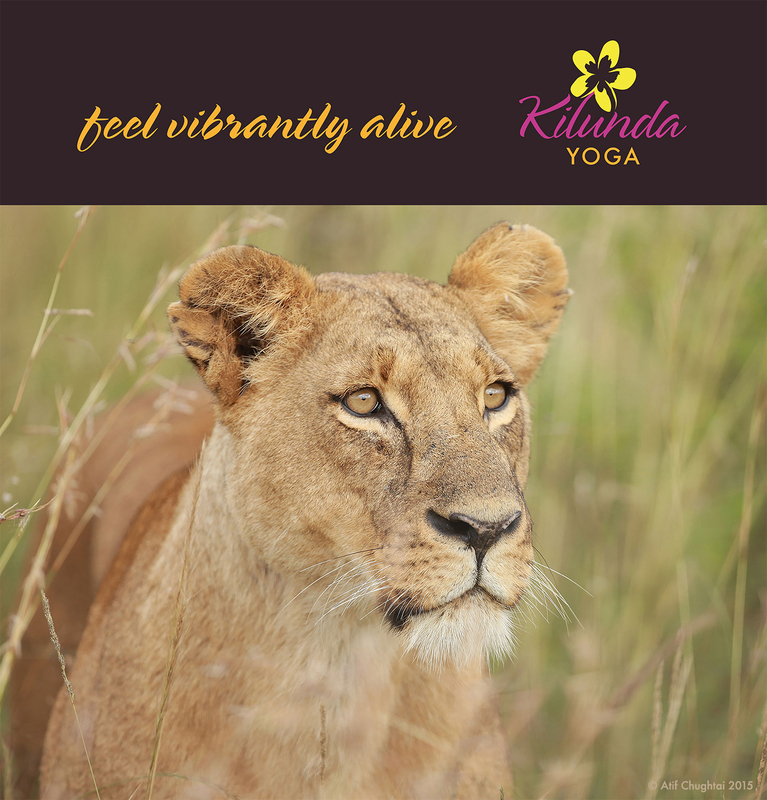 If you’d like to exercise connecting with your inner strength, learning to breathe in a way that creates space internally and brings power into your body and into your life, come and join me in #Lamu soon! 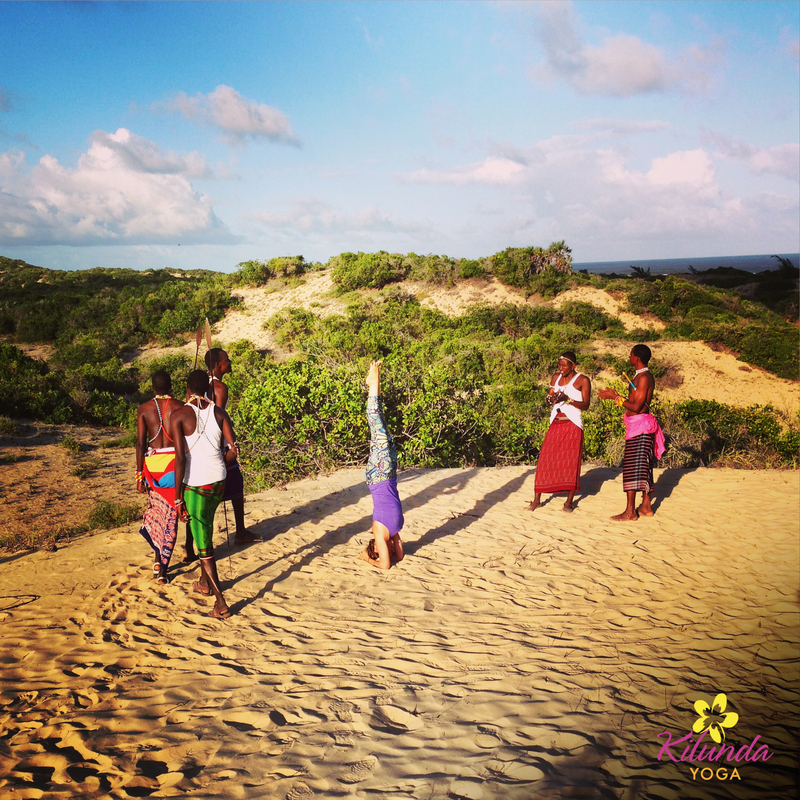 Next opportunity to practice with me: Lamu Yoga Festival following my #ForrestYogaSpeakYourTruthRetreat from March 15 – 19, 2017 at Banana House and Wellness Centre. Our spine is our home and our vehicle in this life we have. Today’s Forrest Yoga Workshop theme was to CONNECT and BRING YOUR BEST QUALITY of attention into every breath and every pose as we work with a back injury or back pain. 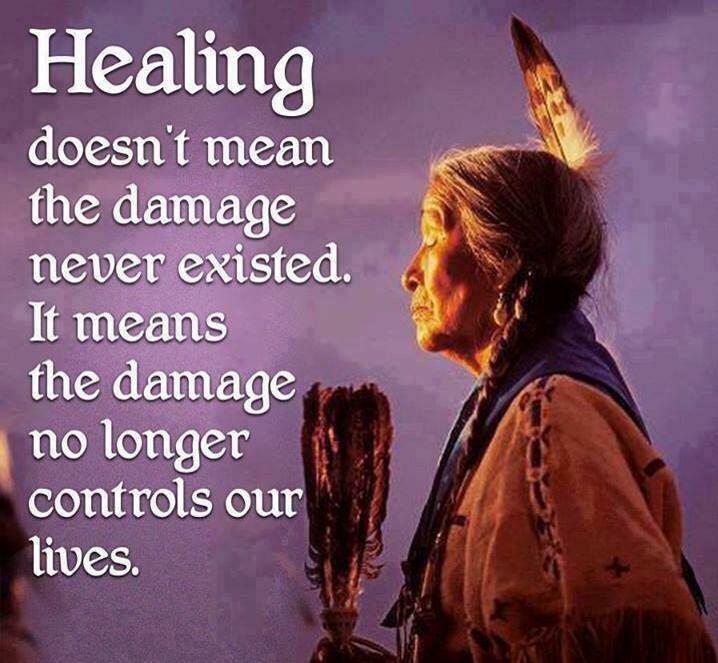 To learn how to STRENGTHEN, and WITHOUT HARDENING INSIDE or SELF-MUTILATING, withstand and overcome life’s challenges in an informed, non-victimized, graceful way that harmonizes with our SPIRIT. So that we may be free of pain and / or live in a pain-freeing way. 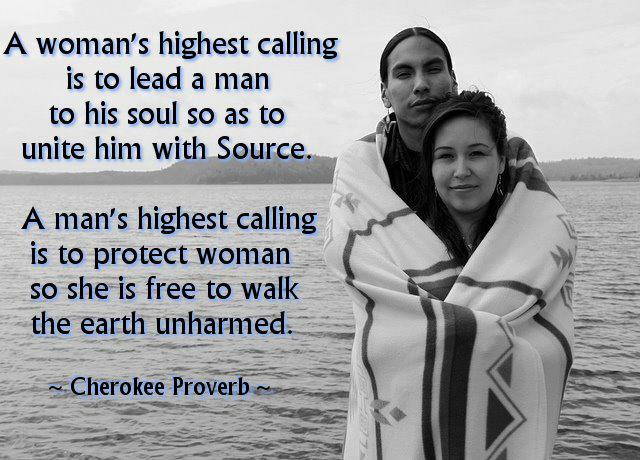 Walk in Beauty – AHO! 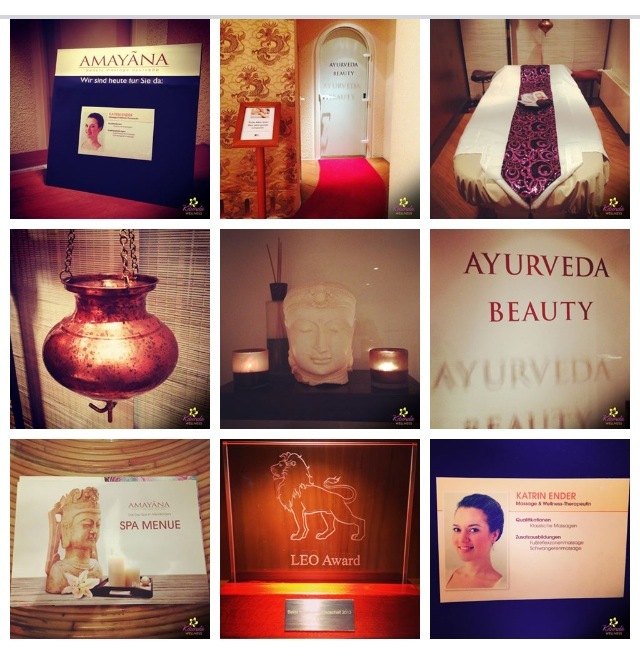 I joined the Meridian Spa Eppendorf AMAYANA team in February 2016, and it’s an absolute bliss to work here. 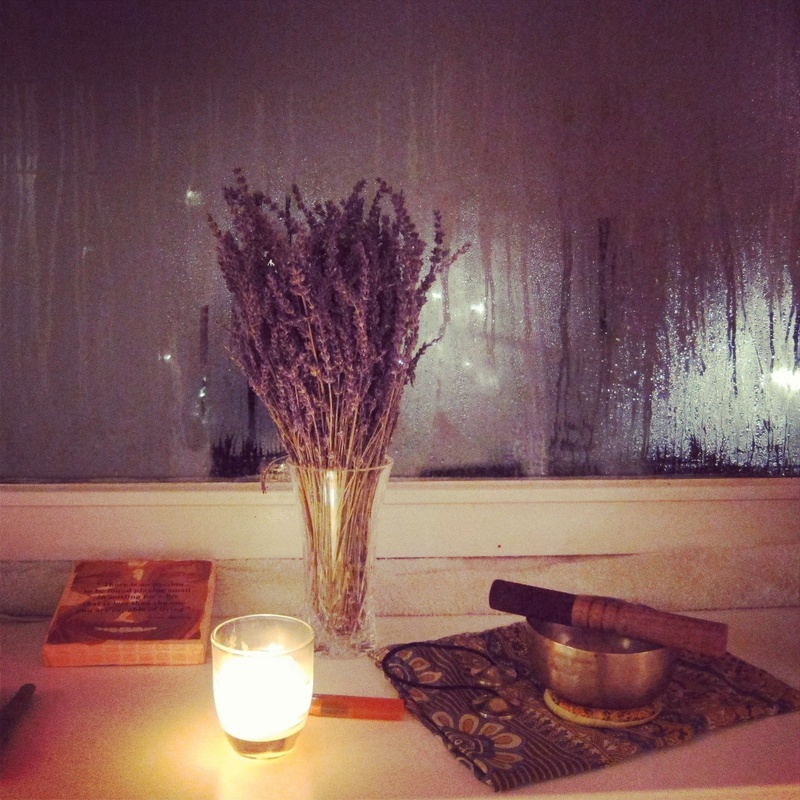 Not only are the therapists and staff absolutely wonderful, but this beautiful space truly holds and nurtures the soul. Come try our wide selection of deeply relaxing and therapeutic wellness massages in peaceful seclusion, and enjoy an ayurvedic tea before and after your treatment! : : : Unwind with me every second Sunday from 4pm – 9pm. Call +49 (0) 40 65 89-12 060 for reservations and ask for Katrin. Beautiful and first ‪#‎doubleShift‬ at the 2015 Leo Award “Best Spa” Winner : MeridianSpa Eppendorf! 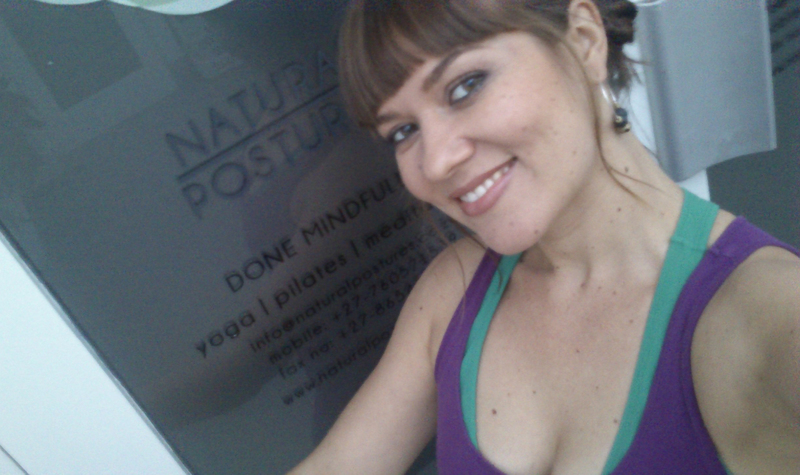 Fully booked with 12 clients, amazing team energy ~ I’m grateful and happy. Come visit me for some deeply rewarding self-care next Saturday, February 27, 4 – 9pm at this luxuriously relaxing wellness oasis! Are your actions driven by money, status, power? Or are they rooted in purpose? Are you doing only what feeds yourself, and is dominating others part of your concept to secure your own position? Or are you feeding yourself as much as serving others, is what you are doing touching, meaningful, healing and inspiring to you as well as humanity? We all row every day. We do something with our time. It is our choice to give our existence a meaning. Whatever you decide to dedicate your life energy to, remember that all good things take time. Even when you found your purpose and decided to have the courage, strength and integrity to live it, it doesn’t mean it will be easy and pretty immediately and ever after. There will be days when the waves will be high, the seas rough, you may row and not seem to advance, fall out of your boat and struggle to get back in. Then there will be days when the ocean is calm, flat like a mirror, and one stroke will propel you far more forward than expected, effortlessly. All the while, what matters is: keep rowing and stay focused. However, it’s really hard and tiresome to row for something empty, meaningless, or when you don’t even know what you are rowing for. So ask yourself: do I have a life vision? Do I know my purpose? If you don’t have a life vision, if you don’t know your purpose, work on finding it. The answer is inside of you. And when you find it, that will be worth rowing for. Fill your life with meaning not with material things. This does not mean we do not need material things to live and manifest our purpose. Yet, a purpose is never rooted in money, status or power. Share this, if you felt this is helpful to you or your loved ones. Follow your impulses, as long as they inspire you. Realize your ideas as long as they ignite passion in you. Express your emotions as long as they exist in you. Discover yourself as long as you live. 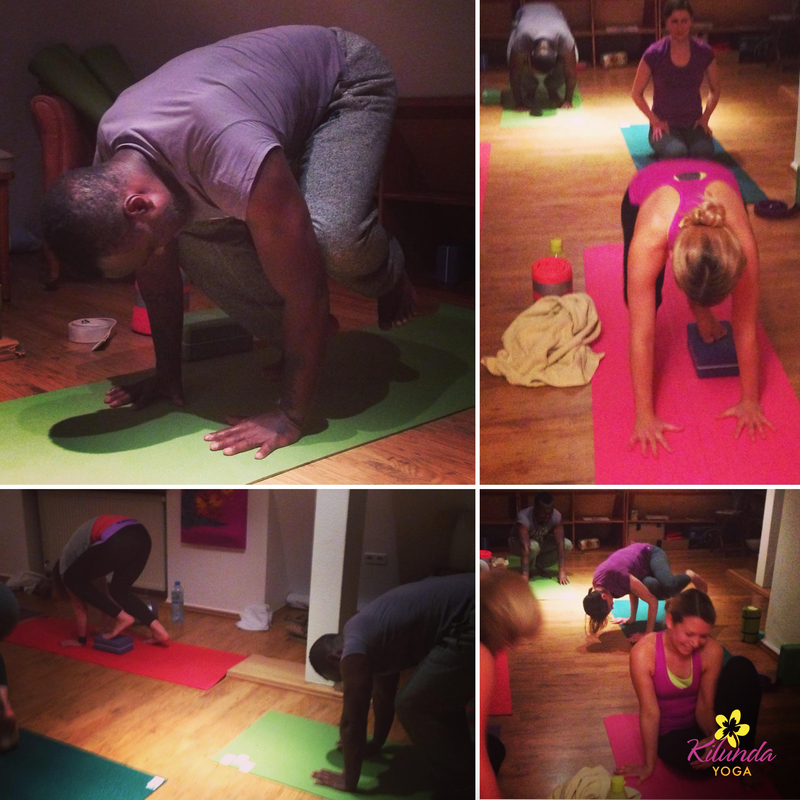 Early morning self-practice at Kenya’s highest – – Mount Kenya. 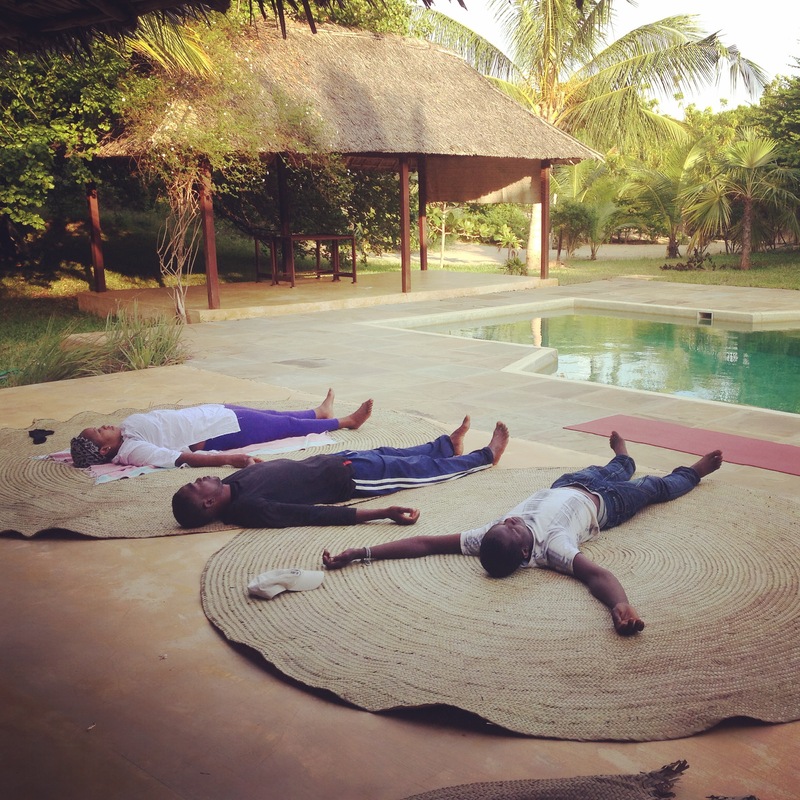 Got blessed by this magical sign in the sky which showed up at exactly 5pm as we opened the first ‪#‎ForrestYogaRetreat‬ in ‪#‎EastAfrica‬! 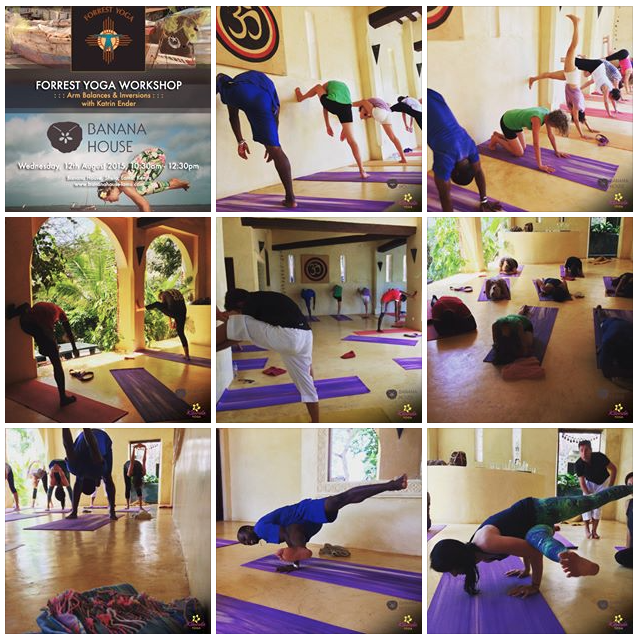 FORREST YOGA “EMBODY YOUR SPIRIT” RETREAT – Watamu, Kenya. Just because you’re a yogi doesn’t make you a saint, a kind or a genuine person. Check your integrity every day. Check your values every day. Check your intent and behaviour every day. Ask yourself: Do I live up to my ETHICS? Am I acting out of KINDNESS? Surround yourself with people who wish you well. Hang out with people who want to grow tall, rise up, and shine, just like you. >>> Do YOU wholeheartedly. Do not care what others think. You are unique. You are not others. Time is precious. Life is NOW. Be LIMITLESS. LIVE BIG. #KilundaWellness — at MeridianSpa Am Michel. Another ‪#‎fullybooked‬ -and highly rewarded-‪#‎MellowMonday‬ done! • A good Massage is 10% technique and 90% Love. • A good massage is meaningful and intuitive. This demands presence and authenticity. • A good massage is done with ‪#‎MeaningfulTouch‬. A meaningful touch is a touch that is clear, pure, and caring, and communicates with the person on a holistic level, feeling and responding to all layers of existence. For this to happen, the person giving the massage must truly care for the other person, must be connected to the heart. I love working with the physical, emotional, spiritual and energetic body. Book your session NOW with me this Thursday 10h – 15h. Last Thursday before my holidays, so don’t miss! 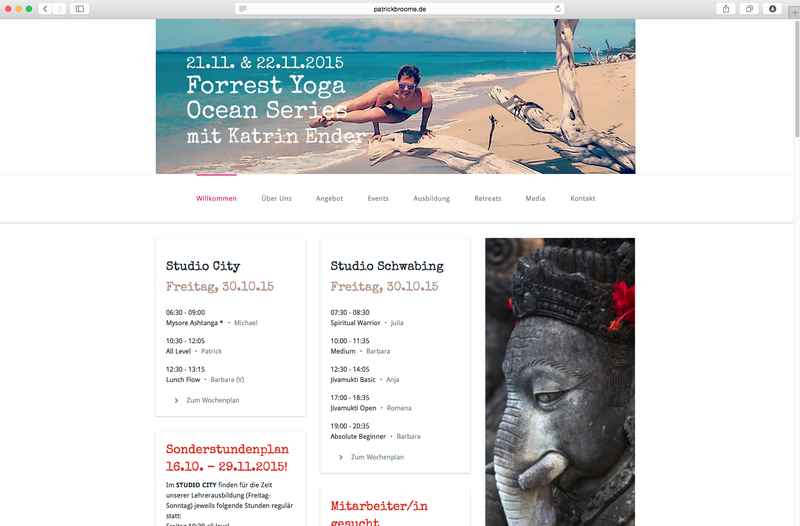 Super stoked to be teaching my first : : : Forrest Yoga “Ocean Series” : : : soon @ Patrick Broome Yoga Munich. Come surfing! There is a “lie” right in the middle of the word belief – as Ana T. Forrest pointed out to me, thank you – that is why sometimes I choose to transcend. Since Body follows Mind we are what we believe. 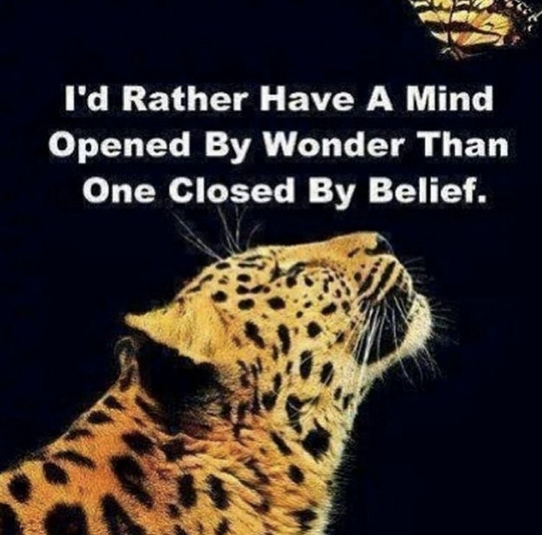 Putting beliefs aside and flowing into abundant possibilities of being allows us to unleash our full potential without the boundaries of the Mind. Because our Souls are greater than our beliefs. Transcend by choice. 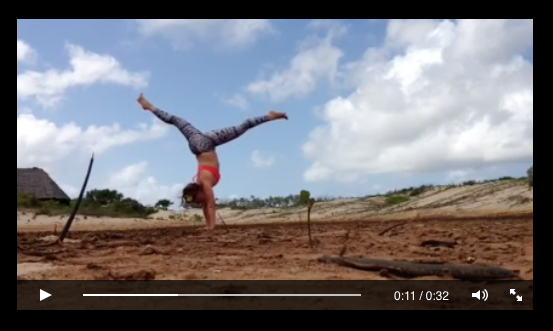 I love experimenting with handstands on soft grounds, because it allows me to develop the skill of using my core strength, active hands and the connection to the Earth to stabilize my stance. 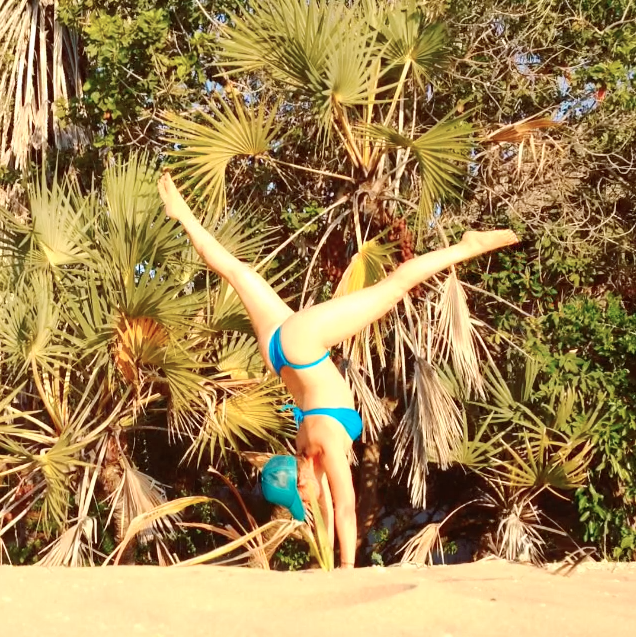 #tbt Handstand in the sand @ Kizingoni Beach Houses, Lamu Island, Kenya. 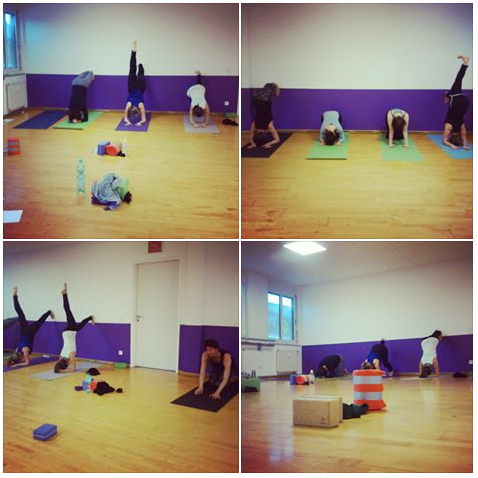 Join me in my upcoming Forrest Yoga workshop “Connect wit the Earth” @ Bikram Yoga Station Munich on November 28, 2015. Expanding the spectrum of experience ~ I’m very proud and happy to now be offering Massage and Wellness Therapy @ MeridianSpa Am Michel as an extension to my hands-on work with Forrest Yoga. As Forrest Yoga Teachers we are renowned for our hands-on assists, which are a product of different schools of healing arts. 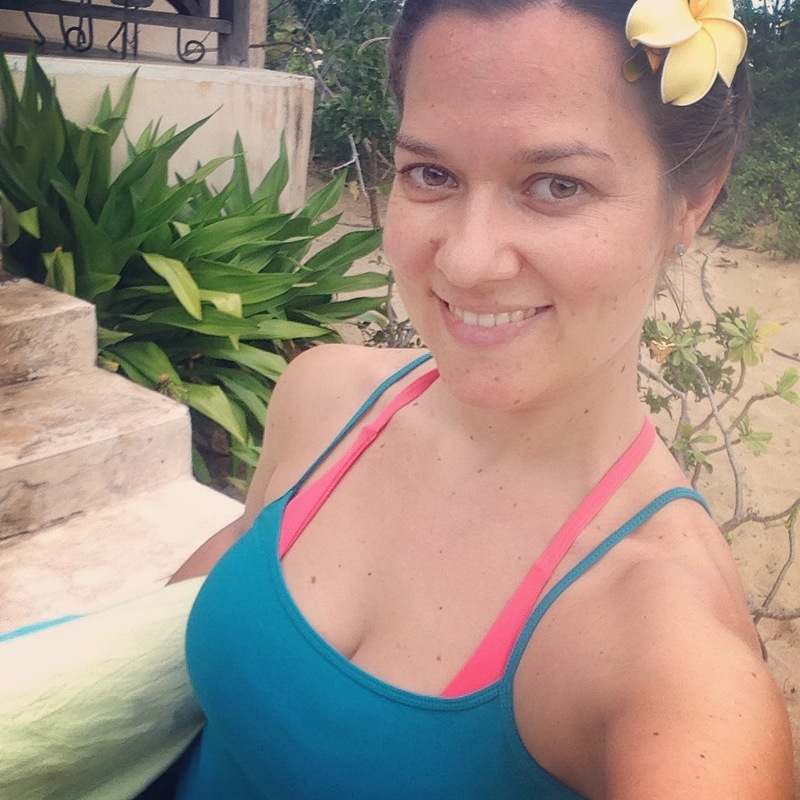 I’m now using the methods and philosophies of Forrest Yoga, my experience with different forms of massage and energy work that I love and find very effective to gently and deeply open the body and get energy to flow, and interweaving those embodied teachings with different classical massage techniques. If you are in Hamburg come and treat yourself to deep relaxation ~ every Monday near the city’s symbolic landmark, the Michel! My thoughts to all women and men in this world who struggle with trying to adapt to unhappy and/or limiting conditions. You don’t need to. Disolve them gently, and move into a space that honors your soul and supports your life’s calling. Unfurl your wings… Don’t let anybody tell you you can’t. Dump the belief that you’re not enough, it’s a lie. We all have our own very unique Beauty in us. Drop the shield, it’s too heavy to carry. Share your gift with the World, it will make it a better place. Spread the Love and shine. Unapologetically, from Heart with Grace. ❤ Katrin. 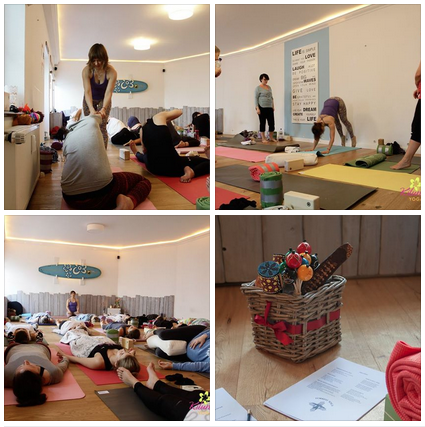 So happy to have had the maginificent opportunity to teach my first Maui-Surf-inspired Forrest Yoga “Gravity Surfing” Workshop at this beautiful space in Hamburg! 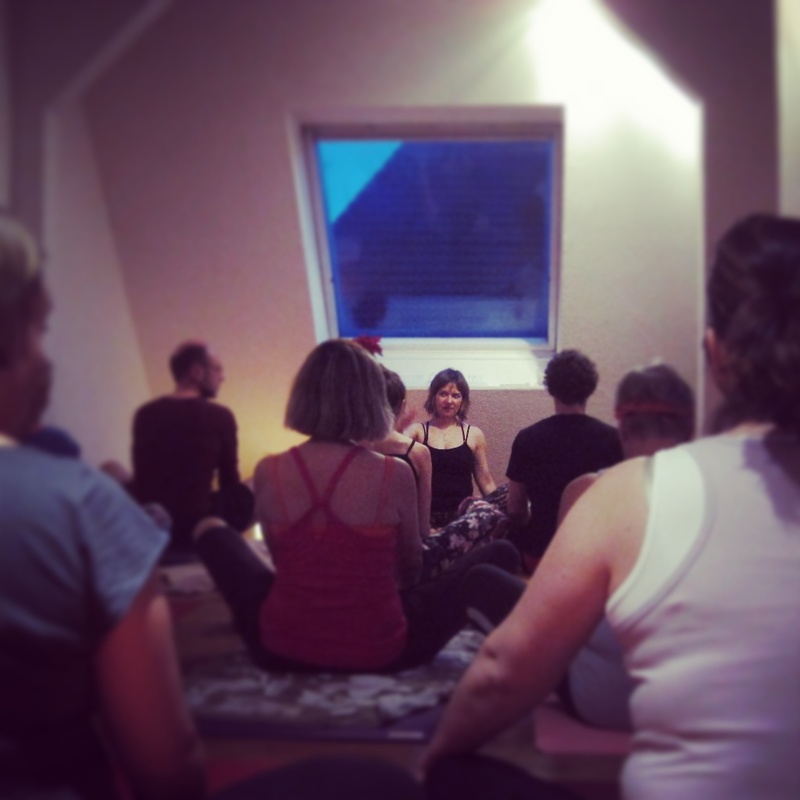 Thank you DAMN GOOD YOGA for having me, and THANK YOU all you wonderful yogis of Hamburg for having come to play with gravity! My teacher Ana T. Forrest. Working with professional athletes has been one of my passions since I started teaching. This super special private session with the 2x Kitesurfing World Champion Jesse Richman on Maui got me extra inspired! 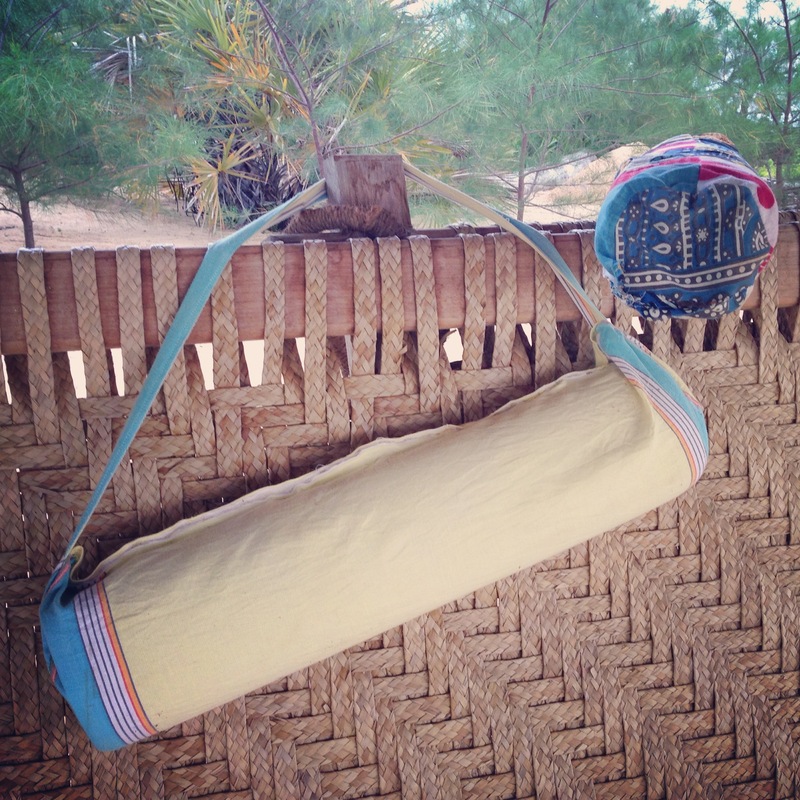 “Surfers and Kitesurfer need yoga… so good for them as the sports make you very tight….We need to unwind! The more flexible you are the better you will kite or surf”, Jesse Richman says. Forrest Yoga proves time and again to be a powerful tool for opening and strengthening the body in a safe and sustainable way, especially after injury, and making the person more resourceful. I got totally inspired by a session with the amazing Kelly Potts in Maui this year! 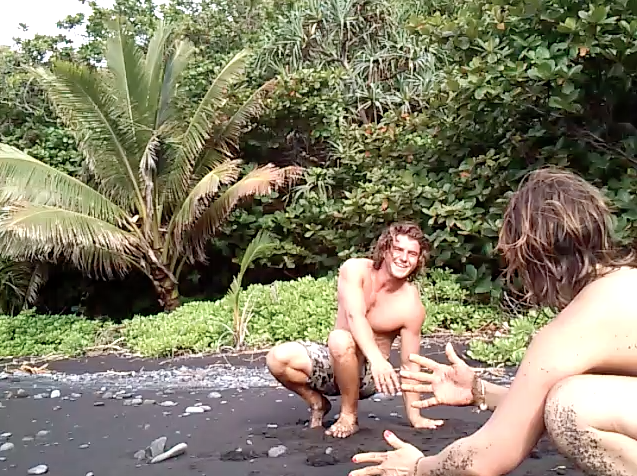 We were both pretty blown away about how much Forrest Yoga can help surfing waves. 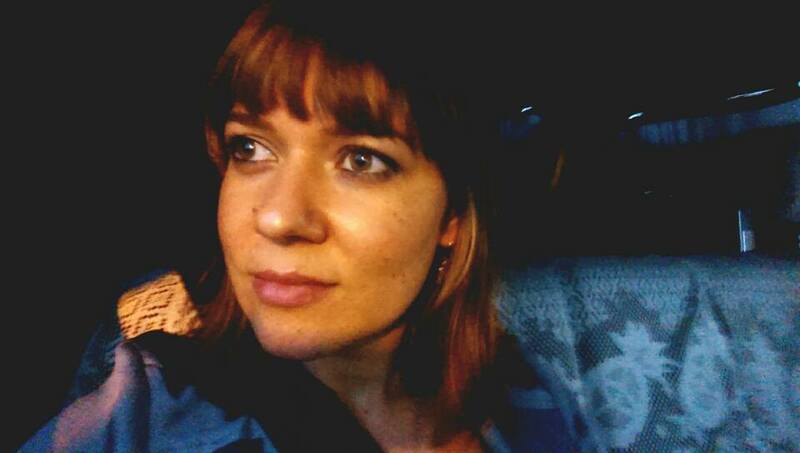 Christina lives and works in Kenya as a Project Coordinator in Wildlife and Nature conservation. 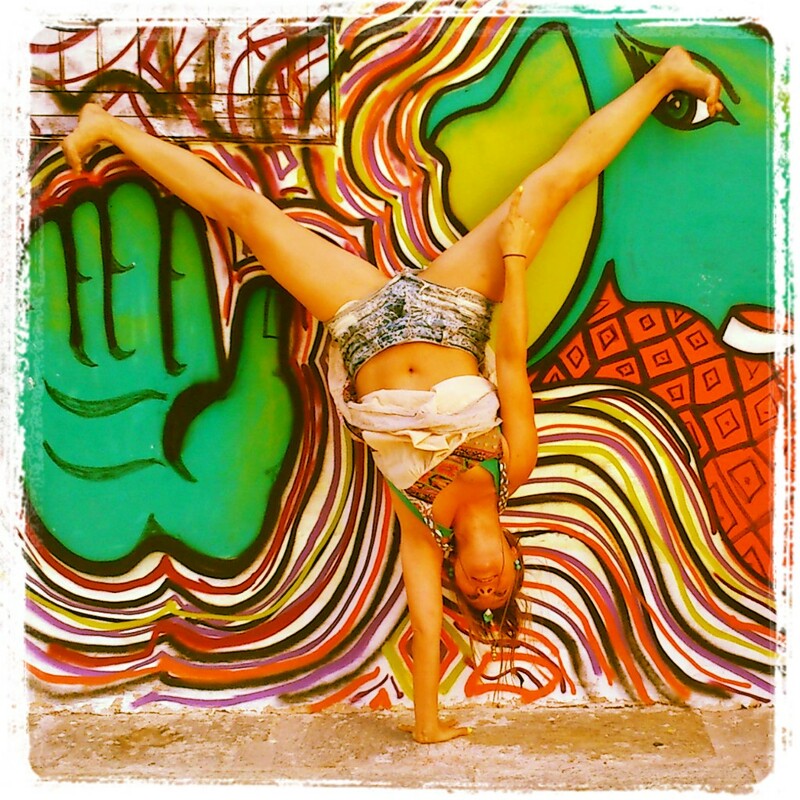 Besides ‪#‎ForrestYoga‬, ‪#‎Reiki‬ and ‪#‎Equilibration‬, you can also talk to Christina about eco tourism, safaris, maasai community projects. 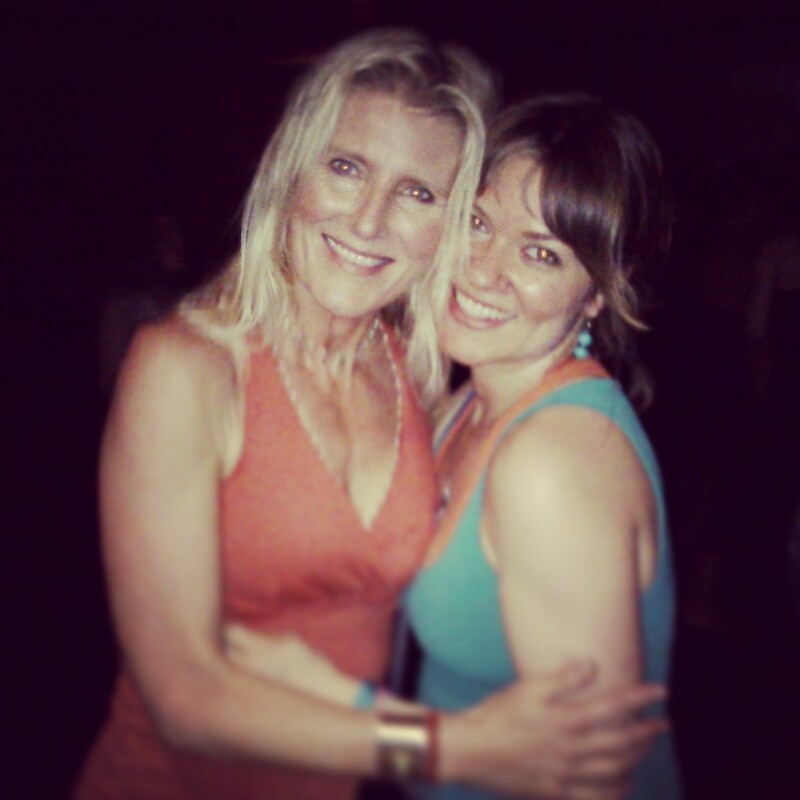 Christina will be assisting me at the upcoming “Embody Your Spirit” Retreat at Watamu Treehouse, Kenya. Come and experience magic! Be touched in a meaningful way. 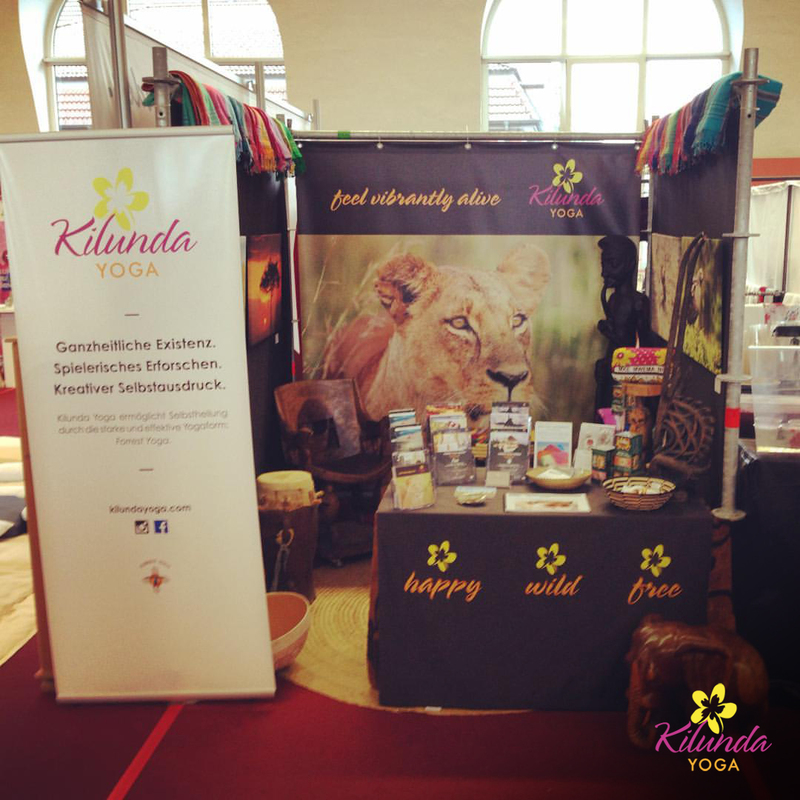 From September 20 – 21, 2015, I had the incredible honor to present my spiritual nutshell, Kilunda Yoga, at “Yoga Fair Hamburg”, northern Germany’s biggest and most renowned Congress for Yoga teachers and Yoga practicioners. 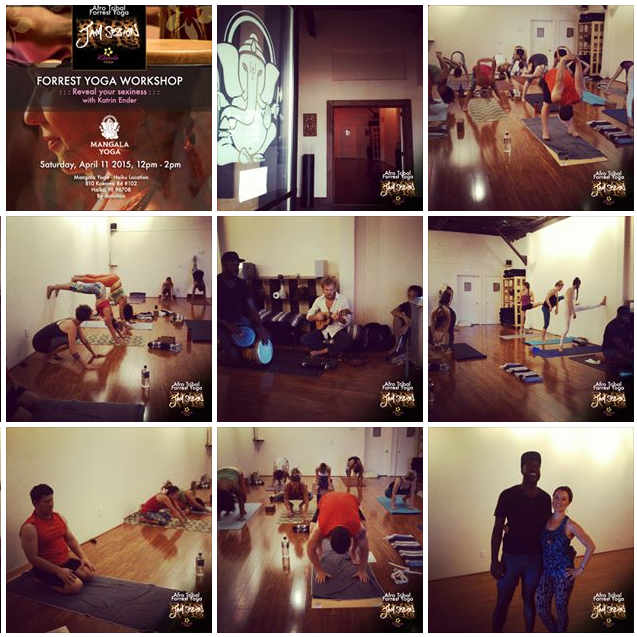 I also had the great opportunity to teach two workshops, one regular “Forrest Yoga for Beginners”, and one format I created from my African side, “Afro Tribal Forerst Yoga Jam Session”. 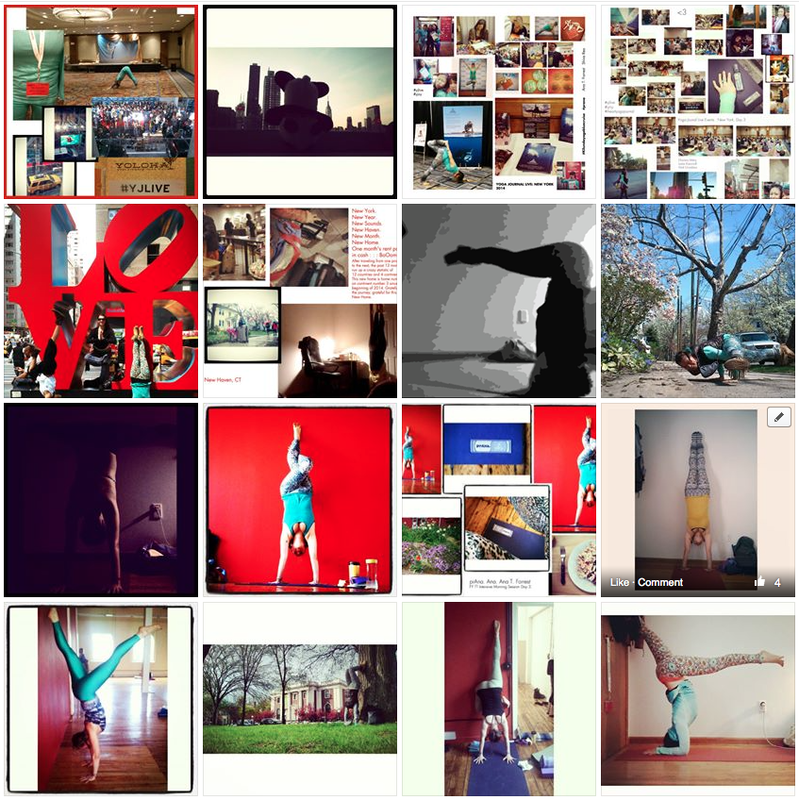 Thank you to all you awesome yogis out there for taking part and for sharing your groovy energy! 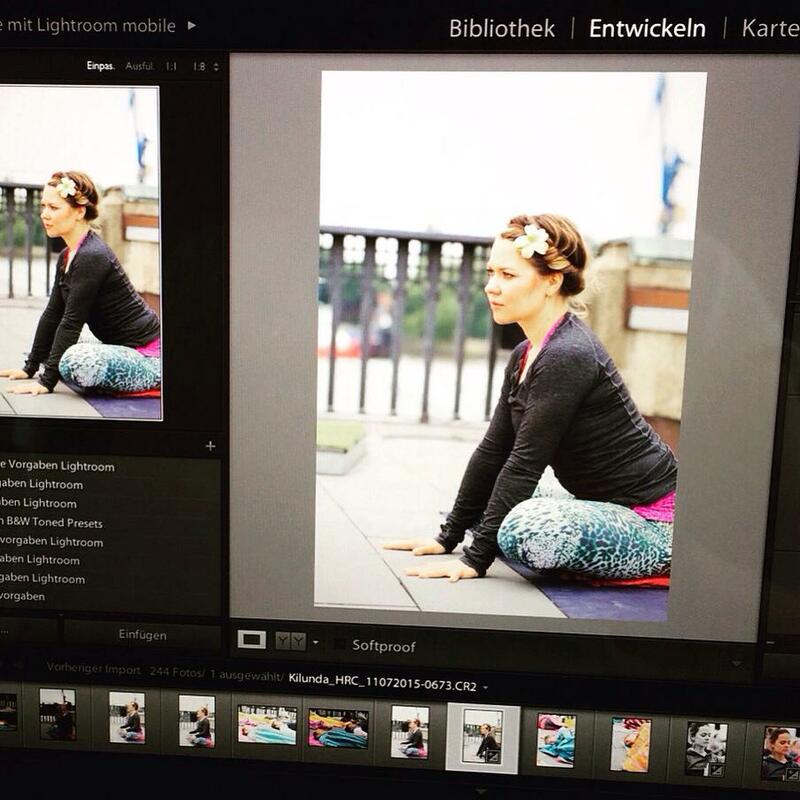 Komm mich besuchen auf der YogaFair Messe Hamburg, heute (Samstag), 19.09.2015 von 10h – 19h und morgen (Sonntag), 20.09.2015 10h – 17h! Eintritt frei. Come visit me at YogaFair Messe from today (Saturday), September 19 10am – 7pm until tomorrow (Sunday) September 20, 10am – 5pm! Entrance free. 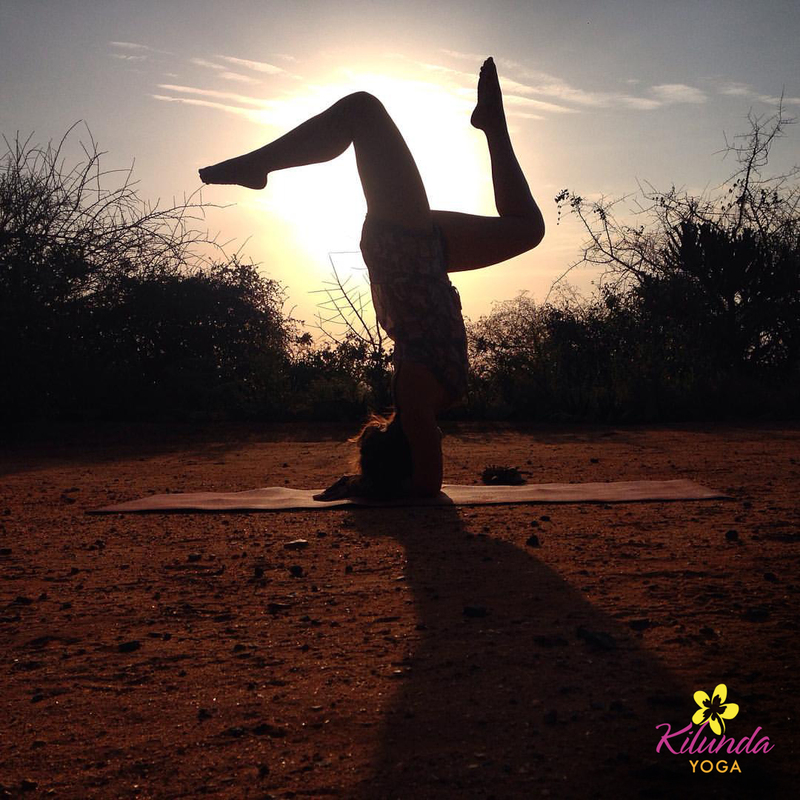 Samburu Warriors Yoga – fly high! Jumping high and smiling big at Kizingoni Beach, Lamu, Kenya! Laughter is the joy of life. There are no cars on Lamu Island, public transport is done by donkeys and boats. Headstand with the Samburus on Lamu. 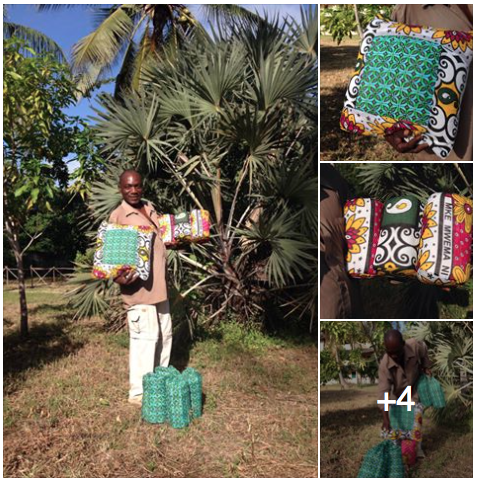 The community empowering and Africa celebrating KILUNDA YOGA Blocks & Rolls are ready! 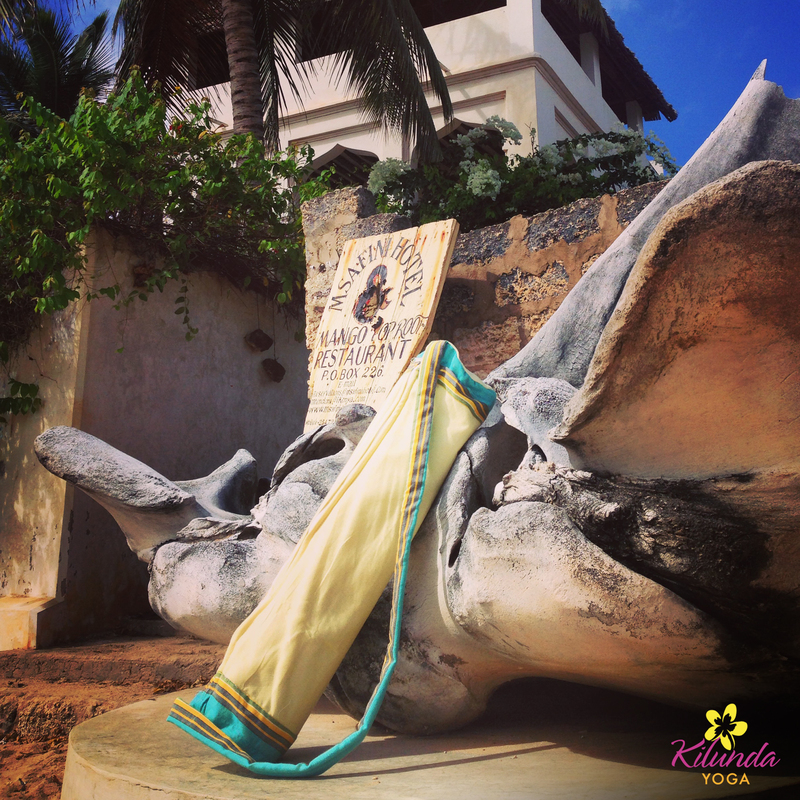 Bright African Kanga covers handmade by tailor Samson ☀😍🙌 right here at beautiful, exquisit Kizingoni Beach – Kenya! Teaching the staff at Kizingoni Beach Houses – a great experience. 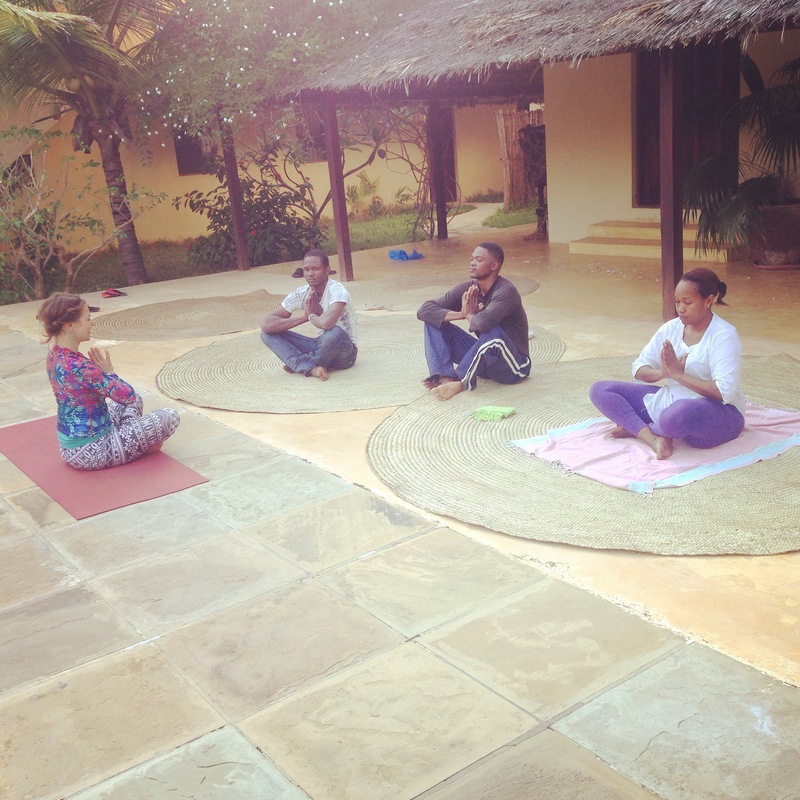 First ever FORREST YOGA Workshop in LAMU, KENYA! What an honor, what an experience – how fun this was!! THANK YOU for having me. Thank you every one of you for your love, openness and beautiful energy – I felt so inspired. 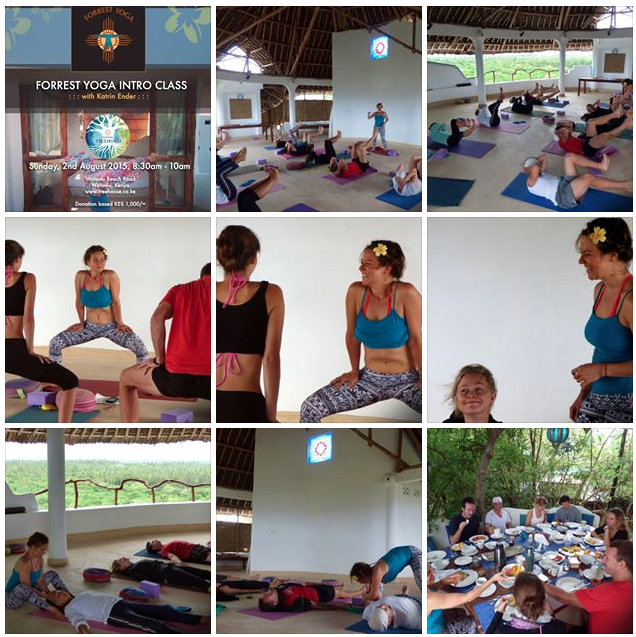 Practicing Forrest Yoga in a yoga space that is half tropical jungle on an island in the Indian Ocean – – what more could one wish for?! There is something very strengthening when you reconnect with your roots. Ever since I returned to Africa I quantum leaped in my inversions, even though I’m not practicing them much. My first one was straight after opening my eyes and seeing the African sun through my window curtain in Tsavo. Boom, out I ran in my pyjamas and with no warm up I stood solid like a rock. Now, when touching the dried up red soil which I know from my childhood in Senegal I suddenly find myself able to hold Handstand Splits like never before. 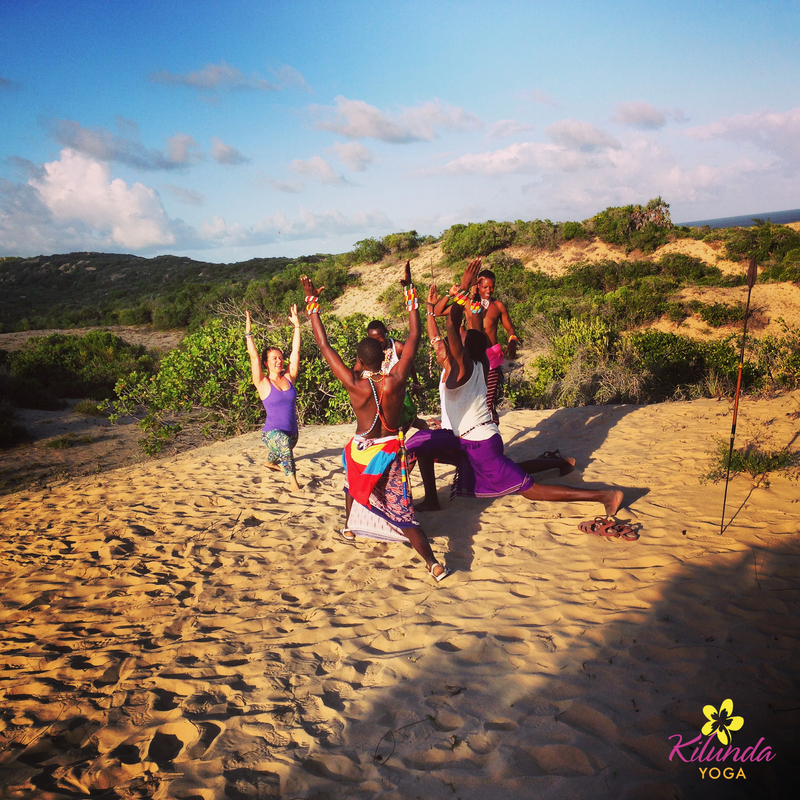 #powerofafrica #powerofspirit #powerofnature #africa#eastafrica #kenya #kilundayoga — at Lamu Island. 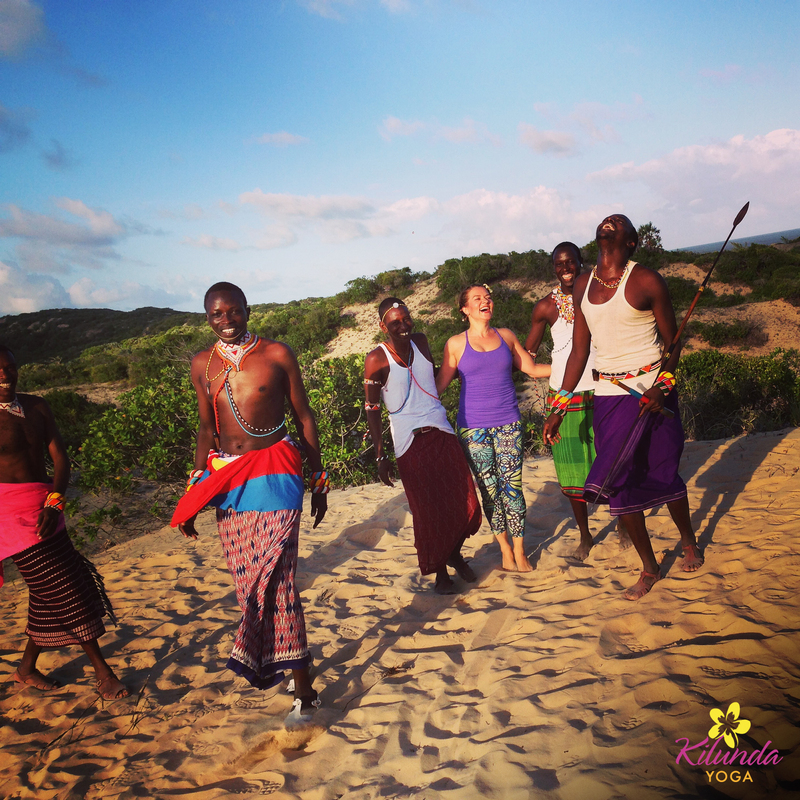 Teaching privates at Kizingoni Beach Houses – a fantastic experience! Loved working with a wonderful Marathon runner from the UK, a pilot from HongKong, UN staff and family. 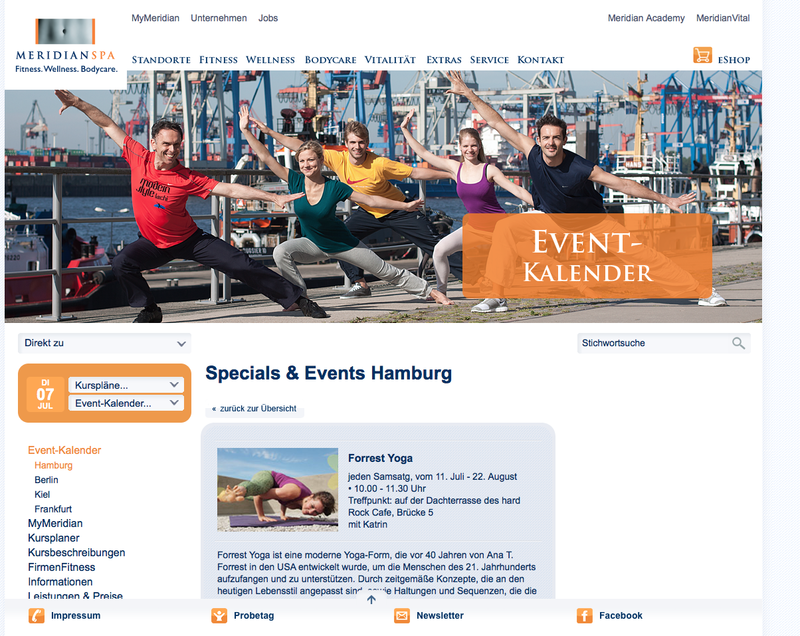 Another awesome FORREST YOGA SUMMER SPECIAL session @ HARD ROCK CAFE HAMBURG! Much THANKS and RESPECT to MeridianSpa for creating such an incredible event with me, thank you for the TRUST. 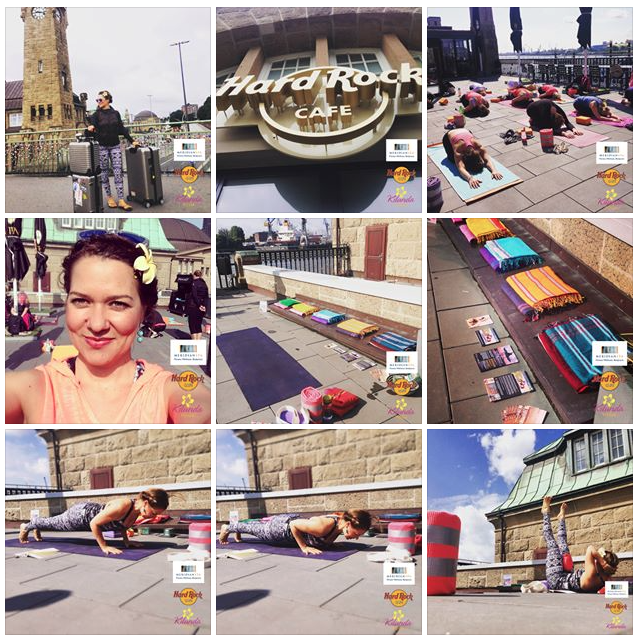 Huuuge THANK YOU to the Hard Rock Cafe Hamburg for hosting this awesome opportunity to practice FORREST YOGA — FOR FREE!!! Top location! 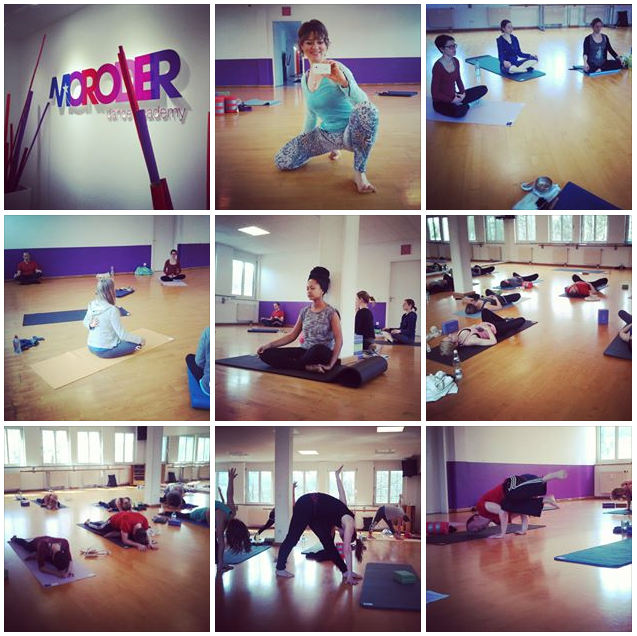 Amazing yogis! 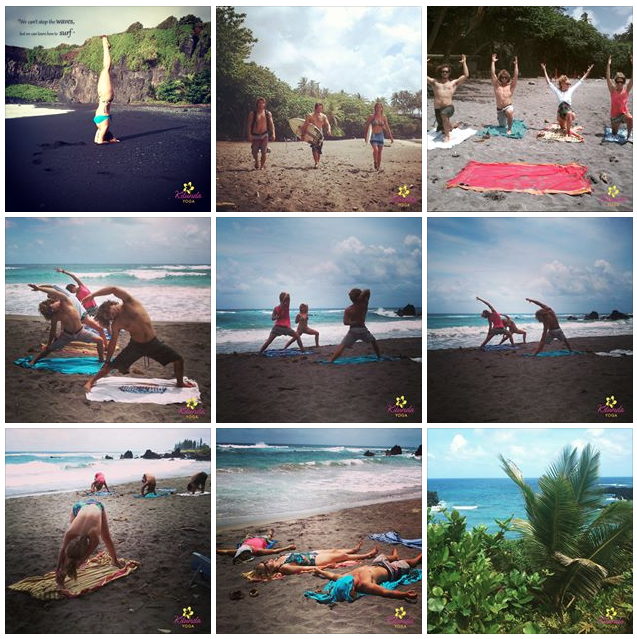 Incredible energy, right by the water, and some juicy FORREST YOGA®, Ana Forrest’s Official Fanpage. I couldn’t do this without my – eco-friendly – wheels: RIMOWA RIMOWA Deutschland who with their pieces of art make bringing FORREST YOGA to the most incredible places on this planet possible. 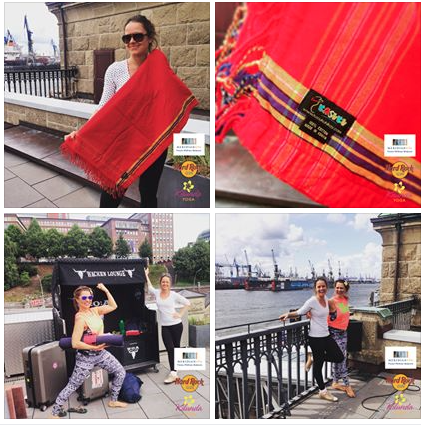 Much LOVE to ITEMS-AFRICA and LAMU KIKOY (traditional East African beach towel) – it is such a joy to have you as my partners, thank you for supporting me in spreading the AFRICAN BEAUTY to our wonderful people! Our kikoys are 100% fair trade. 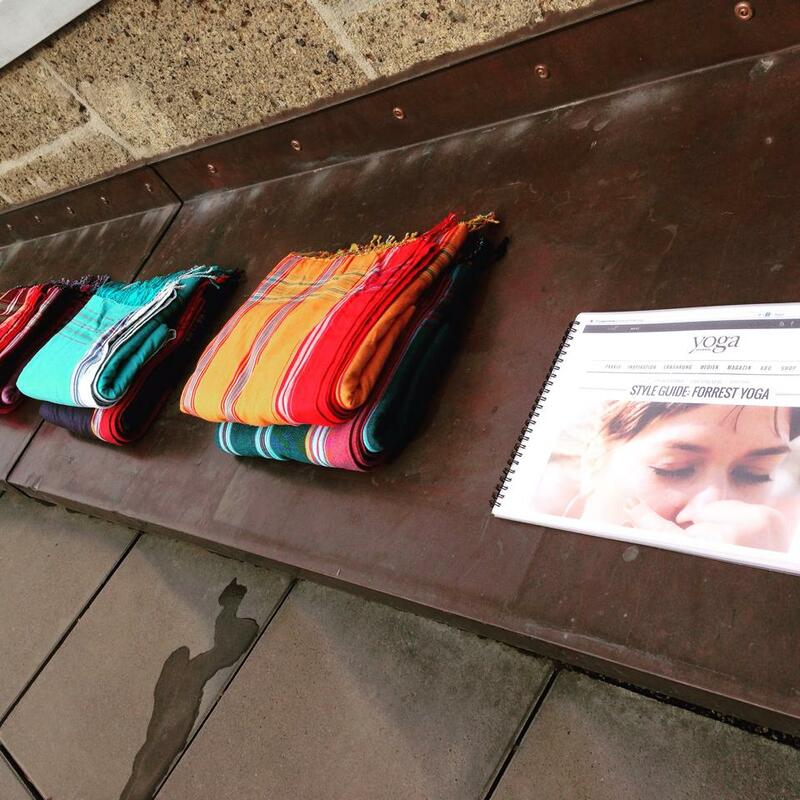 By purchasing a kikoy you are directly supporting the makers and their families in Africa. This is part of ITEMS-AFRICA’s concept. The Kikoy is a national product of Kenya, a country I lived in for a very long time and also the home of my #Spirit, Kilunda. It is a basic clothing piece for me and accompanies me everywhere I go. Kikoys are incredibly resilient, you can wash them in the washing machine and wear them day in day out for years and they will always stay BEAUTIFUL, STRONG and NEVER LET YOU DOWN. They also make you feel very FREE. 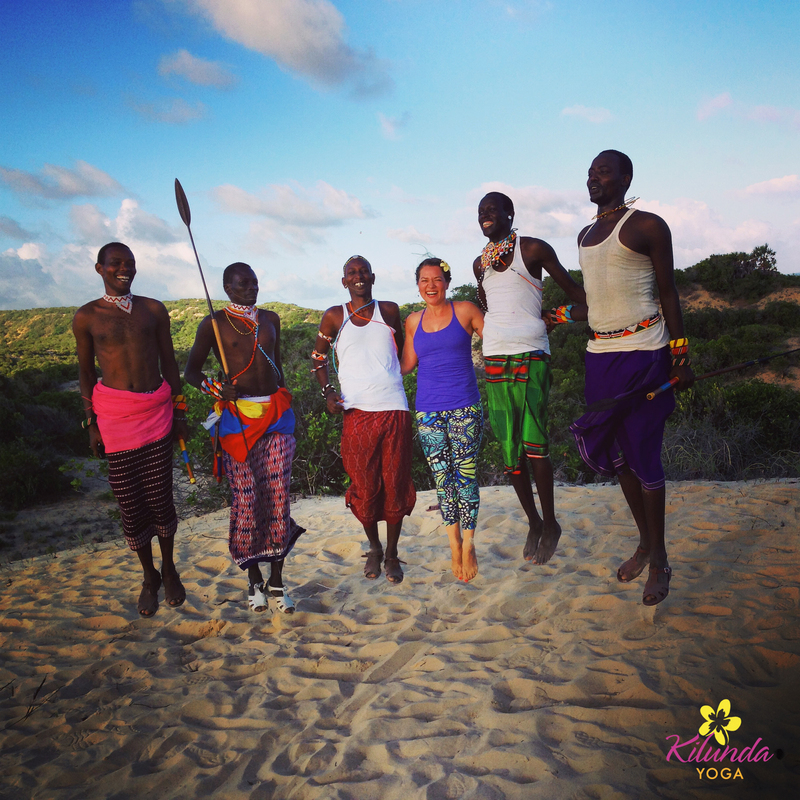 I am now returning to EAST AFRICA for a new and exciting Forrest Yoga project, and shall come back with new inspiration, energy and some smashing beautiful KIKOYS to teach the classic FORREST YOGA session on August 22, 2015 at the HARD ROCK CAFE! 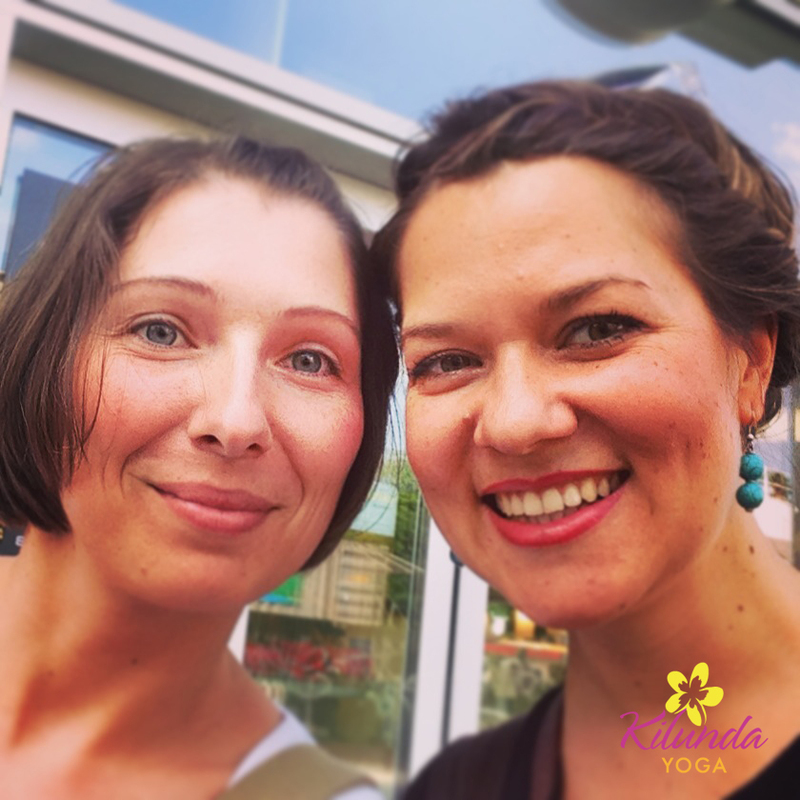 My wonderful and talented colleague and fellow Certfified Forrest Yoga Teacher KATHARINA will lead the Saturday classes during my absence. 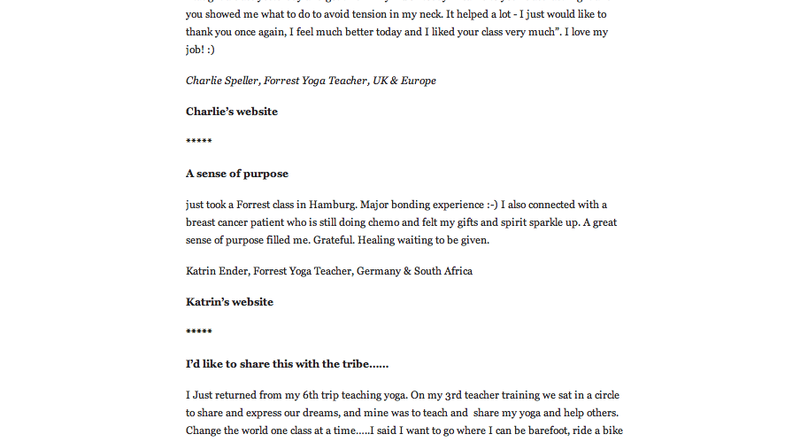 Use this opportunity to learn more about Forrest Yoga, and soak up the MAGIC Katharina has to offer! I will see you again on August 22, bright and shiny, and with lots of AFRICAN sunshine in my heart! On August 29, 2015 get ready for the first ever AFRO TRIBAL FORREST YOGA JAM SESSION at the HARD ROCK CAFE HAMBURG!!! Bringing you the African flavour, Spirituality and LIVE MUSIC together with the most incredible and fun FORREST YOGA session ever! 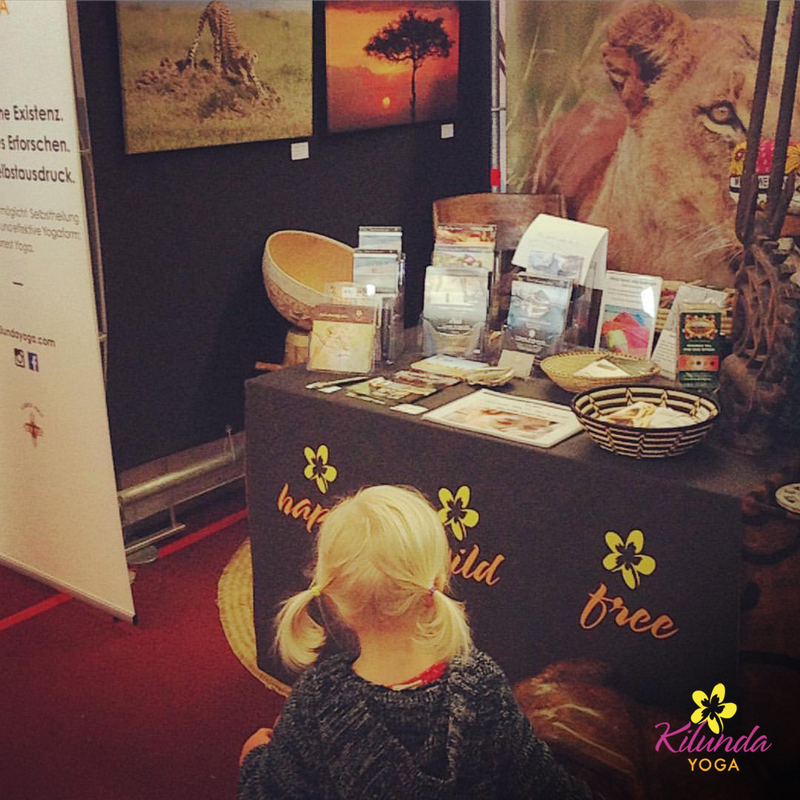 Children are welcome – this is the AFRICAN WAY 🙂 Don’t miss this unique chance to experience a yoga class like never before! 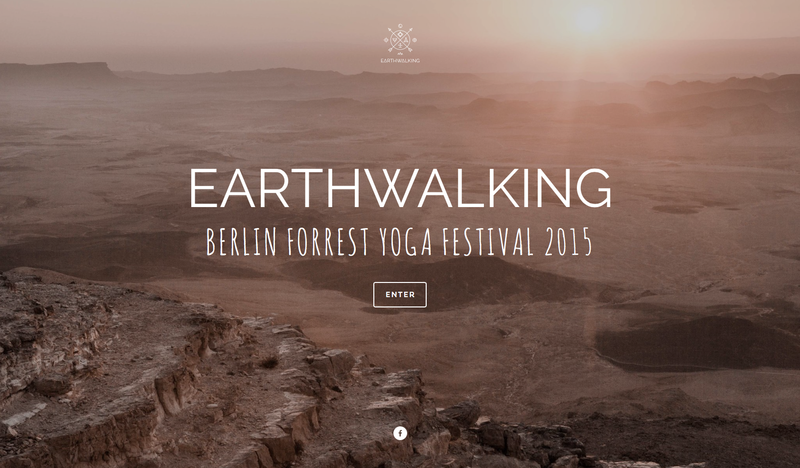 Straight afterwards, I invite YOU ALL to join me on the 12:58h ICE 1507 train from Hamburg Hbf to Berlin Hbf to attend the first ever Earthwalking FORREST YOGA FESTIVAL in Europe! The best international Forrest Yoga teachers will be presenting, and you will have a chance to find out about Shamanism, Bodypsychotherapy, Bodywork, the Power of Words in Yoga, Yoga Ceremony and much more. See you on August 22 at the HARD ROCK CAFE, Hamburg!! I LOVE YOU! Walk, Float, Swim, Fly in Beauty! Es war toll!! 16 grossartige Yogis, hupende Schiffe, leckerer Yogi-Salat! It was amazing! 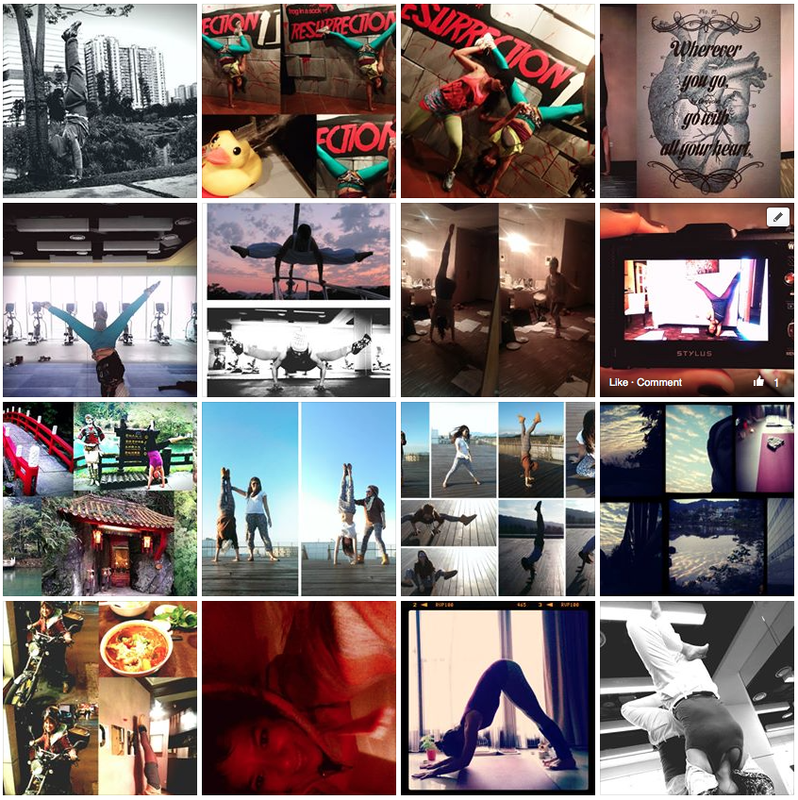 16 great yogis, hooting ships and yummy yoga-salads! 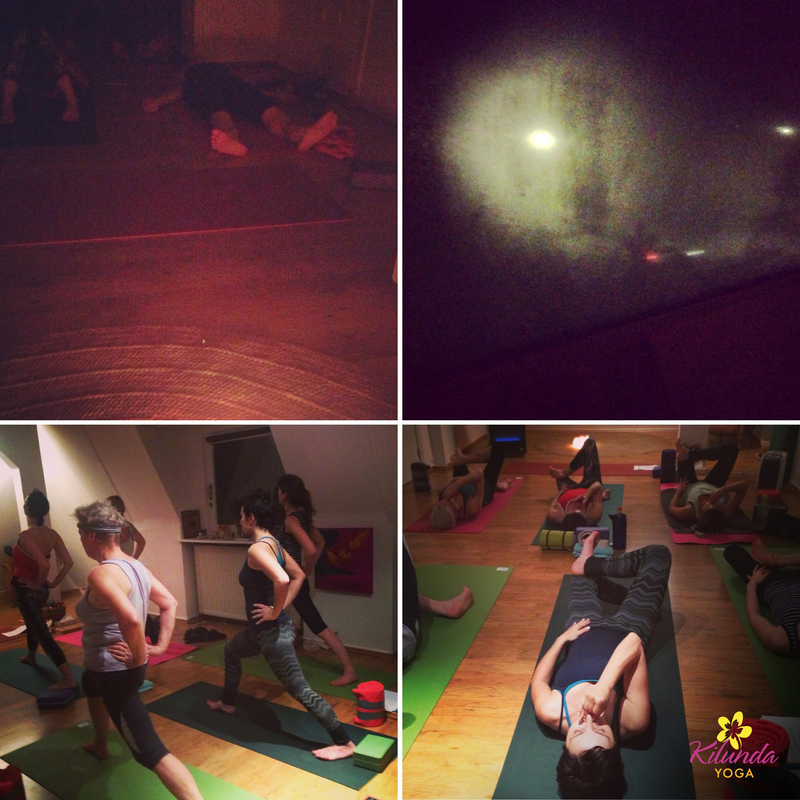 Awesome first session FORREST YOGA® SUMMER SPECIAL Hard Rock Cafe Hamburg ! Nächsten Samstag geht’s weiter! 10h – 11:30h auf der Hard Rock Cafe Dachterasse direkt an den Landungsbrücken! GRATIS! Bring Deine eigene Matte. 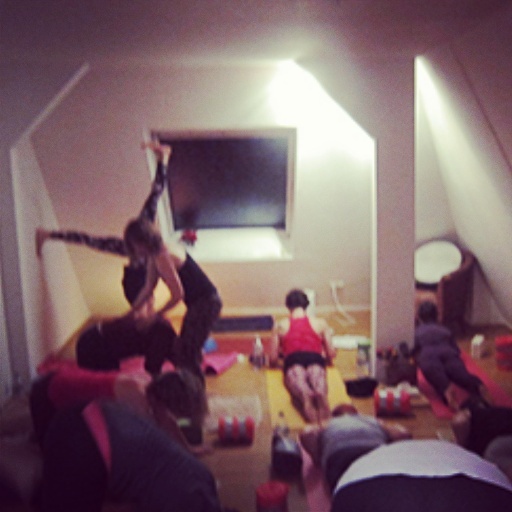 Wonderful first FORREST YOGA Workshop @ PATRICK BROOME YOGA STUDIO München! It was an incredible honor to bring Forrest Yoga to this beautiful place and space, to the studio of a Teacher I highly respect and who has done so much good with his Yoga work. I am deeply touched, grateful and humbled by the trust and this precious opportunity. 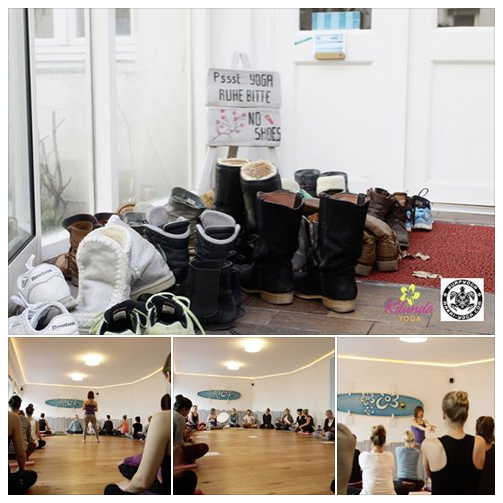 I was also deeply moved by the special atmosphere we all co-created in the 2 days of Yoga ceremony together with all the wonderful students, most of whom had never done Forrest Yoga before, some who were new to Yoga altogether. 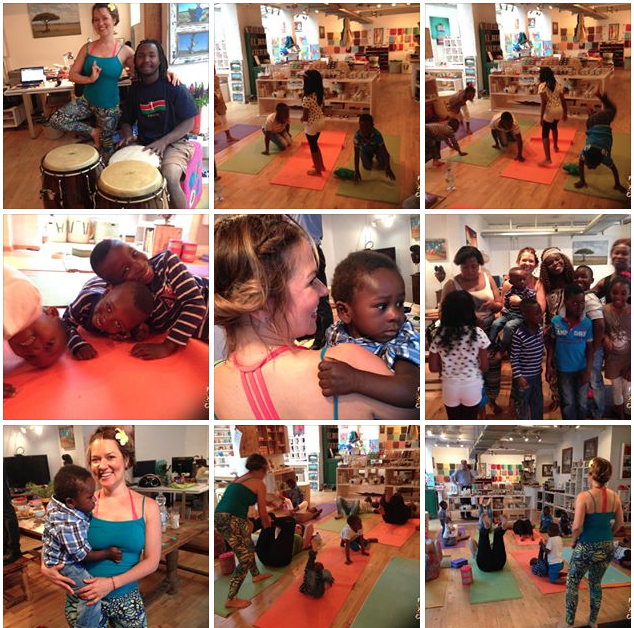 “Creating Space and Aliveness” and “Exploring Strength” has never been so fun and so enriching! You were all so brave and did some incredible work, inside and out! Beautiful. Love and more LOVE to my special assistants, Certified Forrest Yoga Teachers Jonathan Lighty from California, USA (based in Germany) and Isabel Ender from Germany (based in Queensland, Australia) who with their gifted hands and unique energy brought true magic to the workshops! Breathing and moving with you these days was more than I could have wished for, absolutely priceless. I feel blessed. Here’s to celebrating community, authenticity, care, love, strength, courage, life and the therapy which is found in our human togetherness. “If you want to go fast, walk alone; if you want to go far, walk together” – African proverb. Amazing news!!! ❤ So happy to be having the honor to assist my teacher! 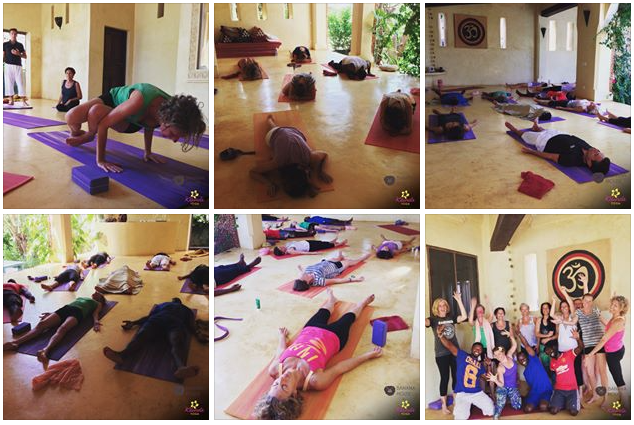 The Forrest Yoga Foundation Teacher Training is a 27-day yoga teacher training that includes 22 days of intensives (group practices) and teacher training exercises, a 3-day Anatomy Course, and a 2-day Business Course. It is a comprehensive program for aspiring teachers, experienced teachers, and yoga students who want to work deeper within themselves. 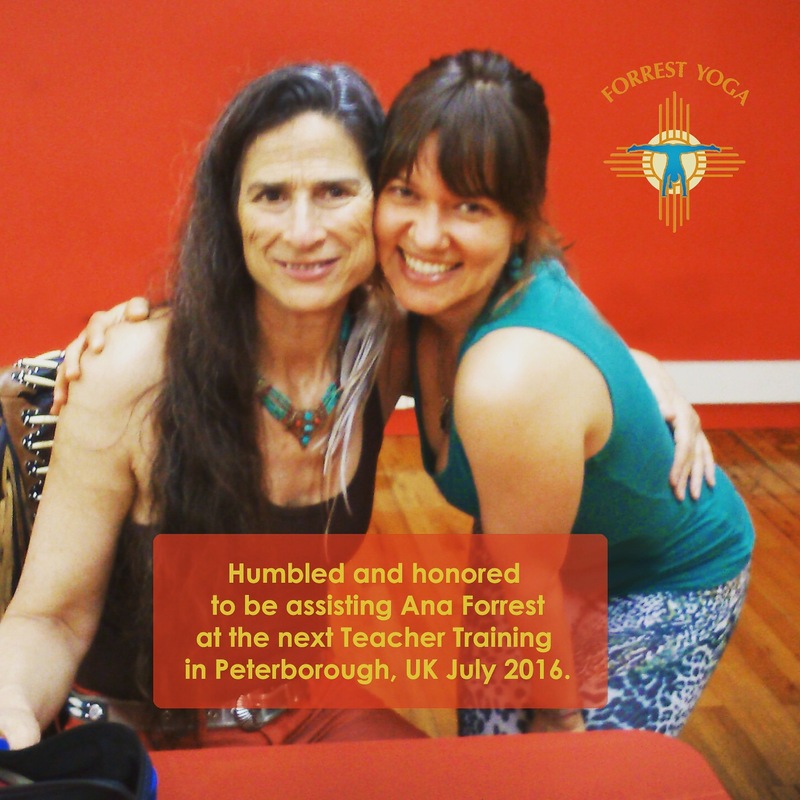 The Forrest Yoga Foundation Teacher Training delivers a solid foundation in the art of teaching Forrest Yoga and is the first step to becoming a Forrest Yoga Certified Teacher. 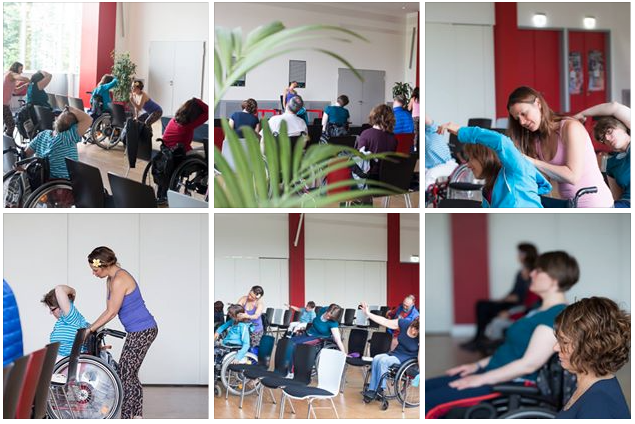 Transcend Boundaries and Create Freedom in Your Body : : : On Saturday, June 20, 2015 at 6pm I had the honor and incredible opportunity to teach Forrest Yoga to people with physical disabilities at Haus des Sports, Alexander-Otto-Saal (Am Schlump), Hamburg, Germany. It was unique and extremely rewarding experience which inspired me to offer more classes with this aspect. Let’s continue to CREATE FREEDOM in our bodies and thus in our LIVES! A dream come true – – first AFRO TRIBAL @ I.T.E.M.S. AFRICA! 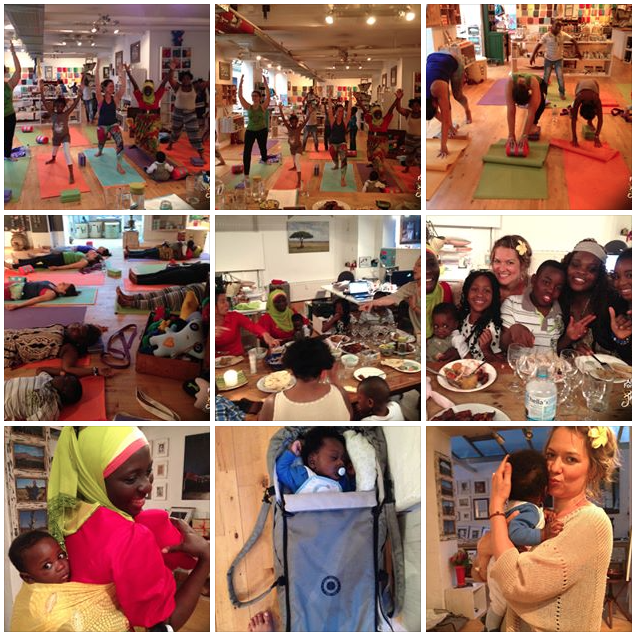 A beautiful evening of Forrest Yoga, celebrating the African way, community, laughter, smiles and tears, Peace and Love, good African food and amazing MUSIC!! The theme song – and post-dinner dancefloor hit – of tonight was definitely: AZONTO! Dance, move, shake it out!! It’s the kids who ruled tonight! Today I was blessed to share my self practice with my beloved sister and fellow Forrest Yoga Teacher Isabel who has just completed a whole month of morning intensives with our Teacher Ana T. Forrest in Sydney/ Australia. Isabel is a Marine Biologist based in Australasia and will be in Germany for 2 months before heading out to her next assignment in Central America. She will be assisting me in most of my June and July workshops. Don’t miss your chance of experiencing Isabel’s magic touch and incredibly inspiring personality! 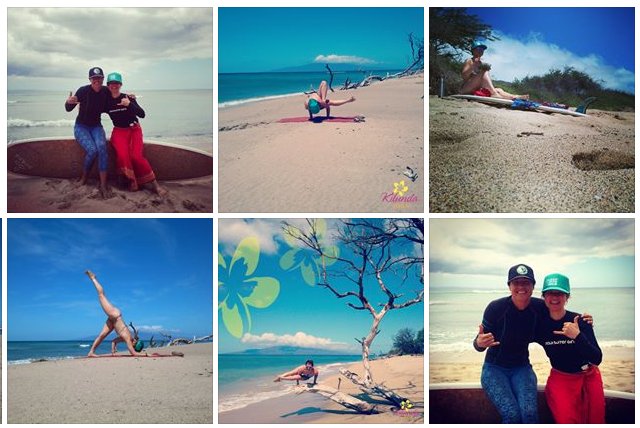 I am grateful and thrilled about having had the amazing opportunity to teach FORREST YOGA to PROFESSIONAL SURFERS on this fabulous beach on the east coast of Maui. Thank you, Shawn Richman, Anna Campbell and Jesse Richman. It was a huge honor and incredible experience to be sharing this practice with you. Thank you for your trust and openness. 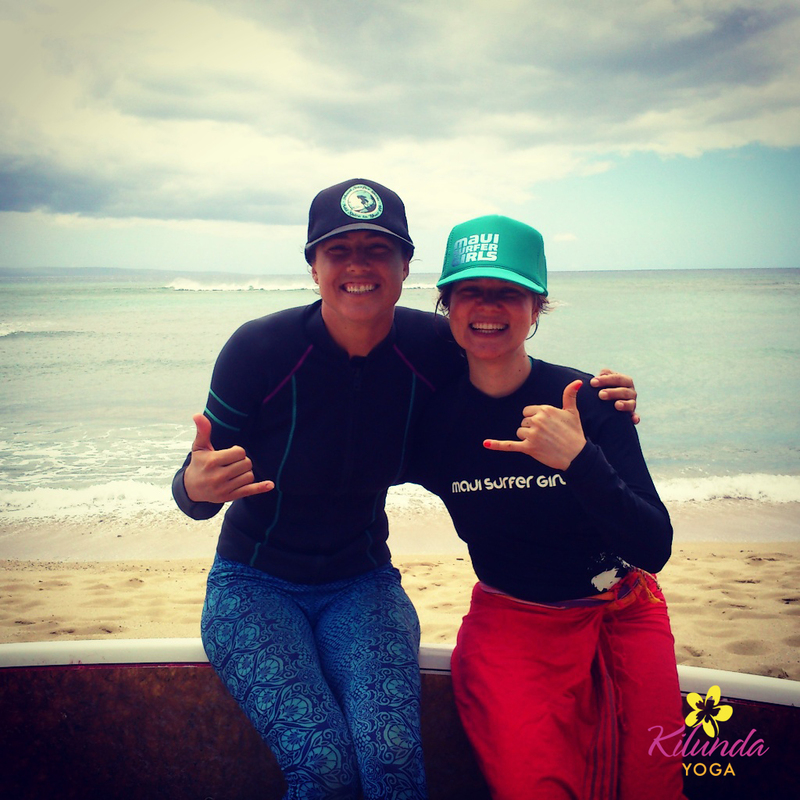 This wonderful yoga session, as well as my own surfing experience with pro-surfer Kelly Potts, inspired me to develop more Forrest Yoga classes/ workshops/ retreats for professional surfers and athletes. 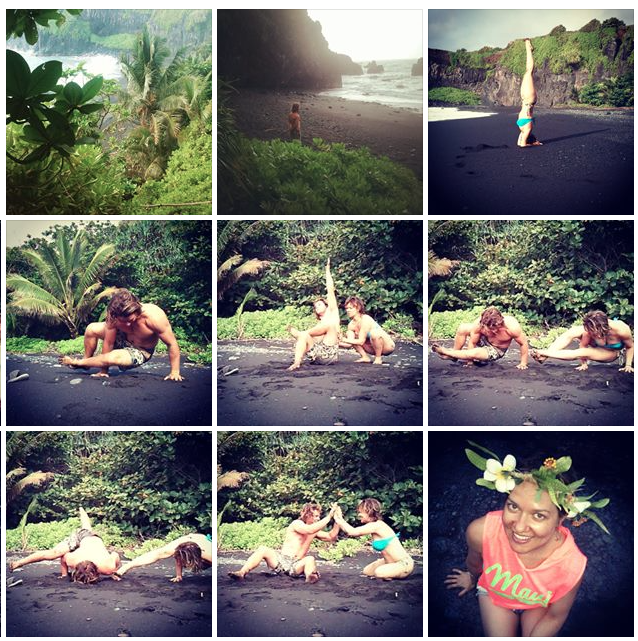 Amazing private Forrest Yoga session with 2x Kitesurfing World Champion Jesse Richman on one of Maui finest beaches! His feedback was amazing and very inspiring. 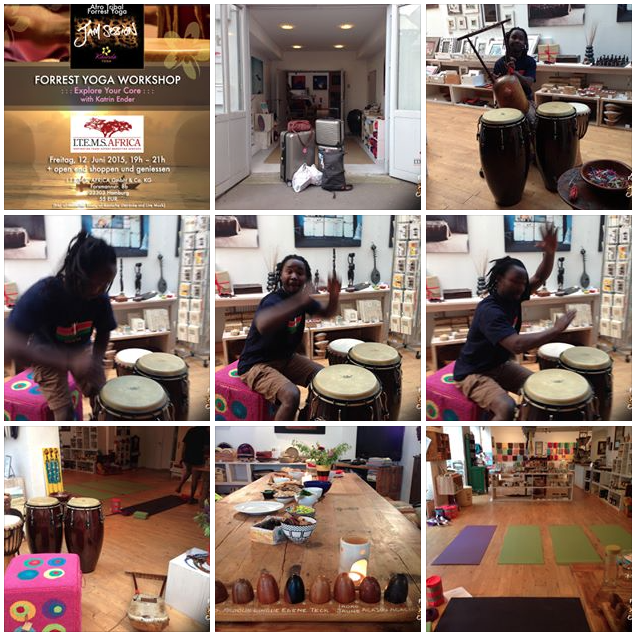 Amazing first AFRO TRIBAL FORREST YOGA JAM SESSION @ Mangala Yoga Studio in Hawai’i! Thank you for your embrace, MAUI and all you beautiful YOGIS of Maui, it was such an honor to share my beloved Forrest Yoga practice with you and introduce to you the african ethics and cultural teachings I was blessed to grow up with as a child in West Africa. 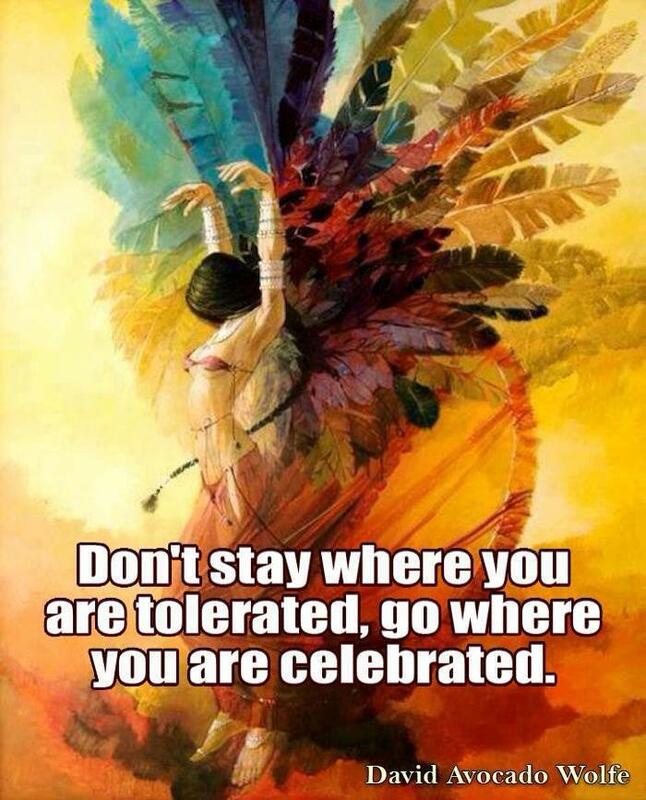 Continue to celebrate your origin, celebrate your creative power! Greatest surf sesh with Professional Surfer Kelly Potts! 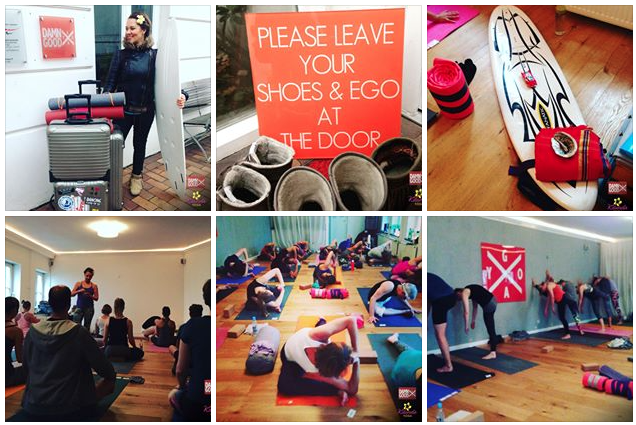 We were amazed how much surfing and yoga have in common. Thank you for yet another wonderful workshop at Moroder Dance Academy, Munich! We had so much fun!! Working with dancers is such a joy because of how much they are able to translate verbal instructions into physical movement/ poses. Dancers also bring a highly charged emotional and mental body to work with. 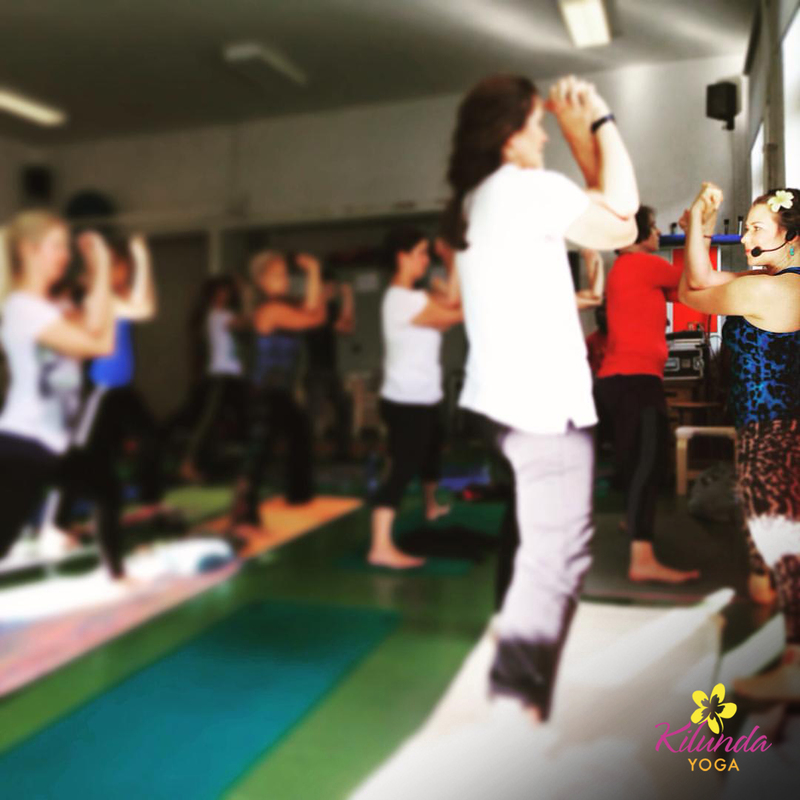 When working with creative people or people working in the creative field of physical expression, the benefits of yoga are absorbed so quickly and appreciated so deeply. This is very rewarding for both student and teacher. What is more important to a dancer than his/her body? I love working with dancers and athletes giving them innovative methods and approaches through the powerful practice of Forrest Yoga, because it helps them heal from injuries, sustains their health and holds the key to a happy and healthy life full of unique personal and creative expression. 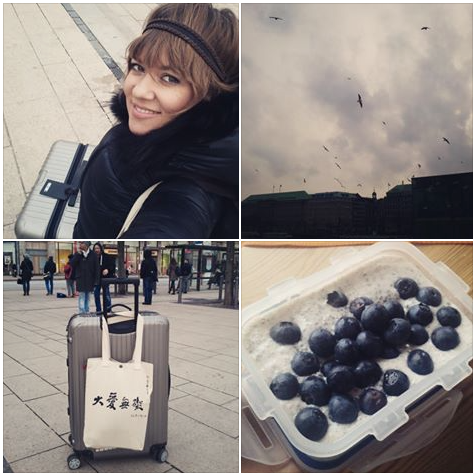 On my way to my first class today – – along with my Munich workshop gear, Taiwan food and tea bag, and yummy yogic breakfast. 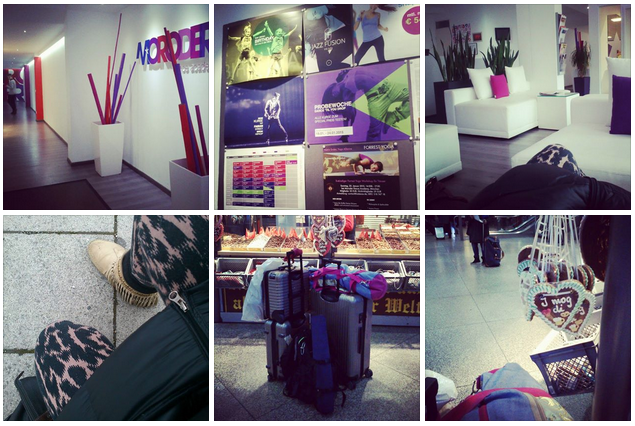 See you now, gentle people of Hamburg-Eppendorf! 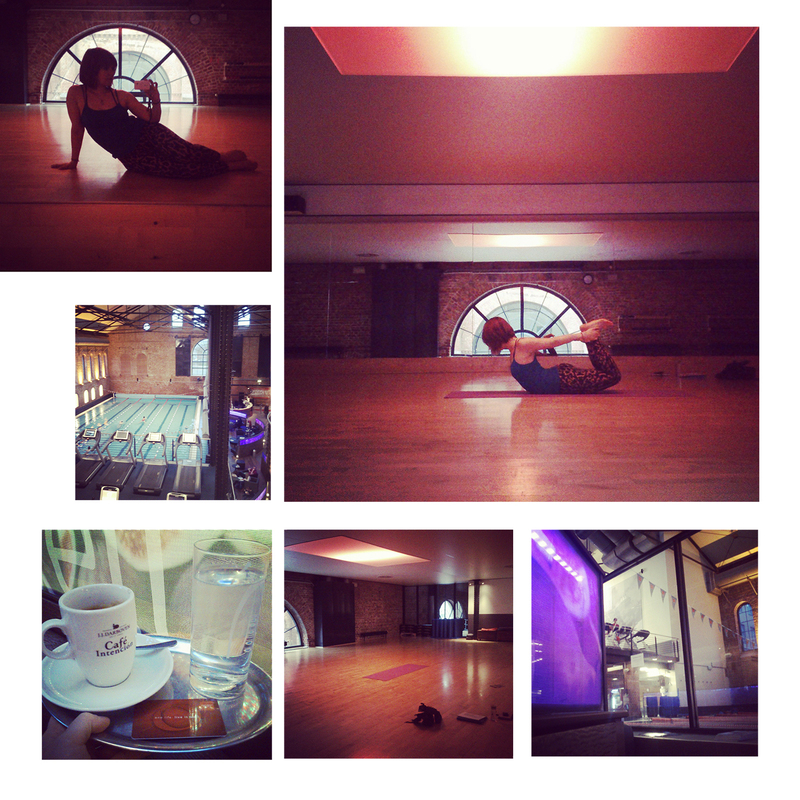 Ringing in a beautiful yoga weekend of all levels : : : Gentle : : : Gym : : : Breakdance. In that order. 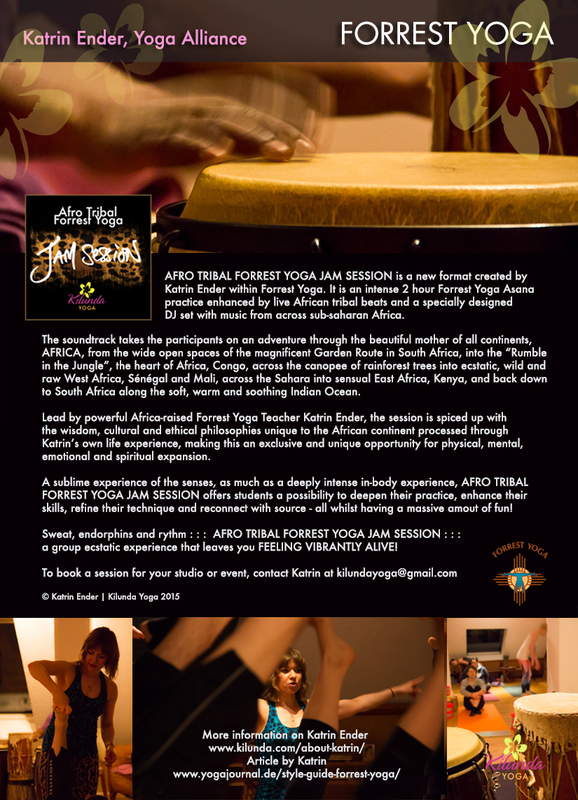 Launching “AFRO TRIBAL FORREST YOGA JAM SESSION : : : a muscial sweatasana full of endorphins and rythm : : : bringing you the best of FORREST YOGA and the AFRICAN CONTINENT in a fun 2 hour full flavour in-depth body experience that leaves you FEELING VIBRANTLY ALIVE! 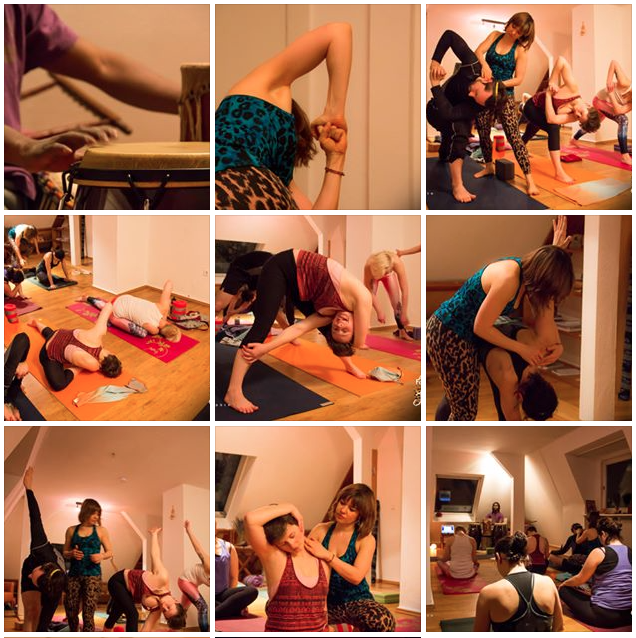 Thank you all for coming to Kilunda Yoga in Hamburg/ Germany! I’m very thrilled to be introducing my new Forrest Yoga format: AFRO TRIBAL FORREST YOGA JAM SESSION! 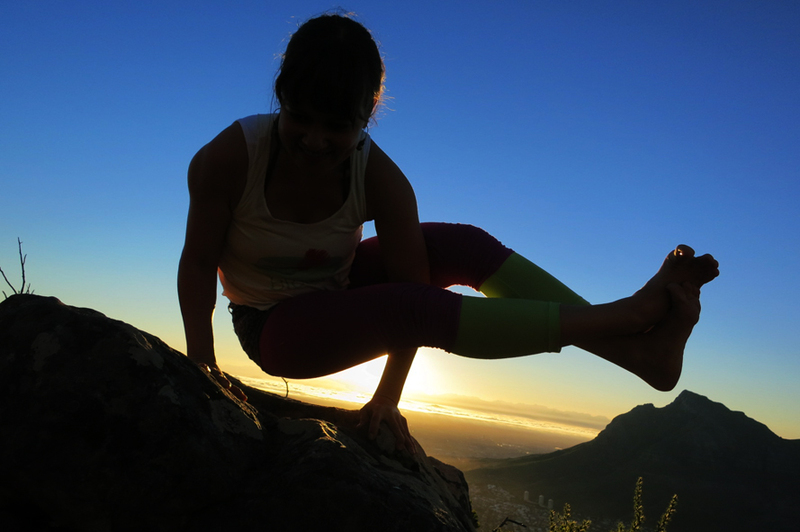 A musical sweatasana mixing the best of FORREST YOGA and the BEAUTY of the AFRICAN CONTINENT. There was a time almost two years ago where I already wrote something with the title “six months”. It was my first inspirational post and also my first beauty report. 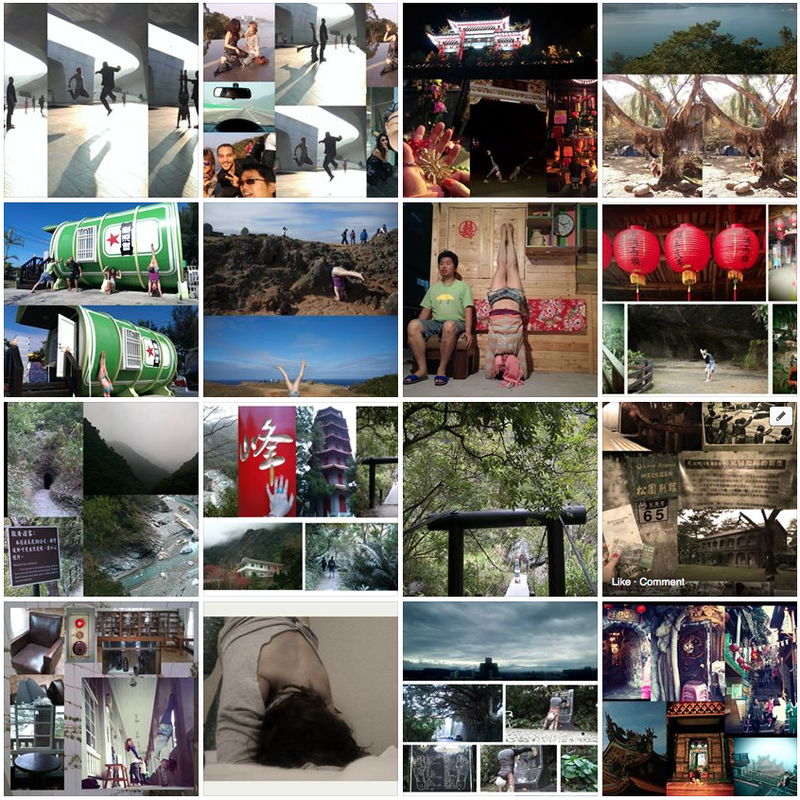 It was the first time I talked about what I had done with my life while I had been offline for the first half of 2013. And how much my life and health had positively changed following the Forrest Yoga Teacher Training in Cape Town, South Africa. I looked back at a lot of “firsts” during those incredibly life-enhancing and healing first round of “six months”: becoming a Forrest Yoga Teacher, doing previously unthinkable hand balancing poses on top of mountains, scuba diving with Ragged Tooth Sharks in a tank without a cage, certifying as a marine fire fighter with the South African Coastguard, which included pulling heavy hoes and wearing fire proof gear weighing at least 30kgs – all whilst the doctors had said I was never going to be able to carry anything heavier than my handbag. 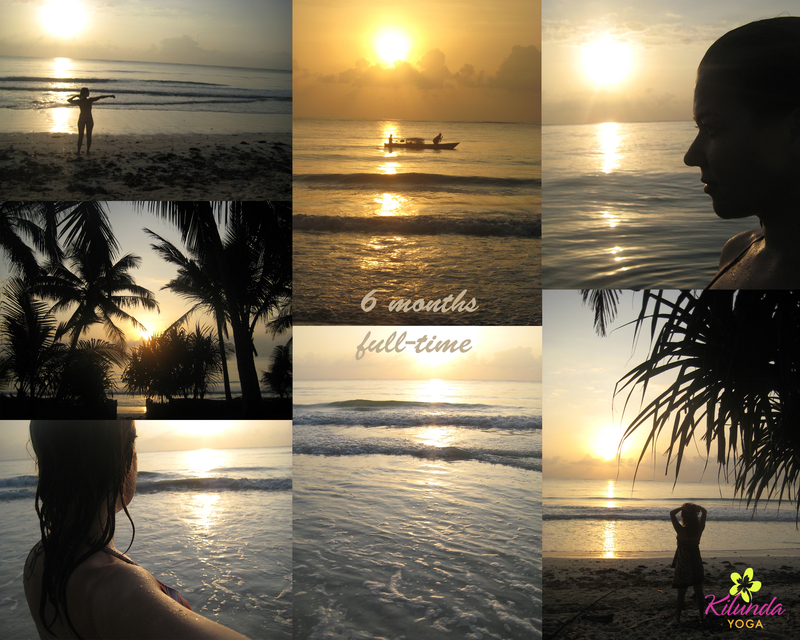 Now, I have another “six” to celebrate: six months of running my yoga business full-time – and full-on! 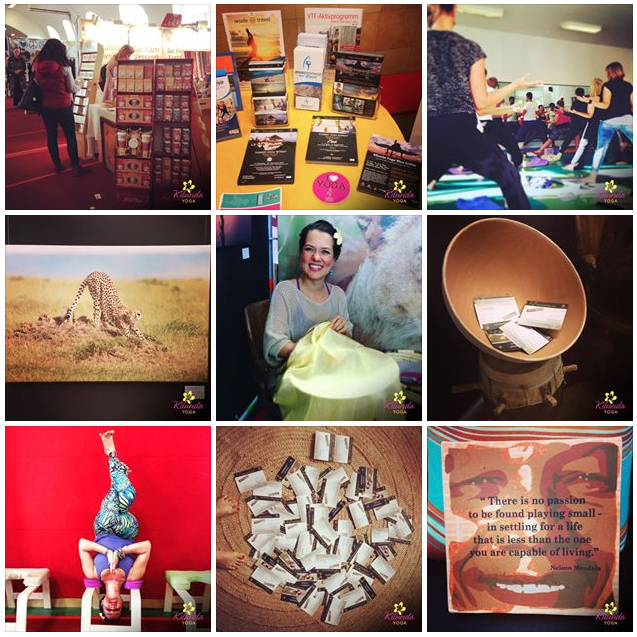 – and six workshops in six weeks to kickstart this wonderful year of 2015! 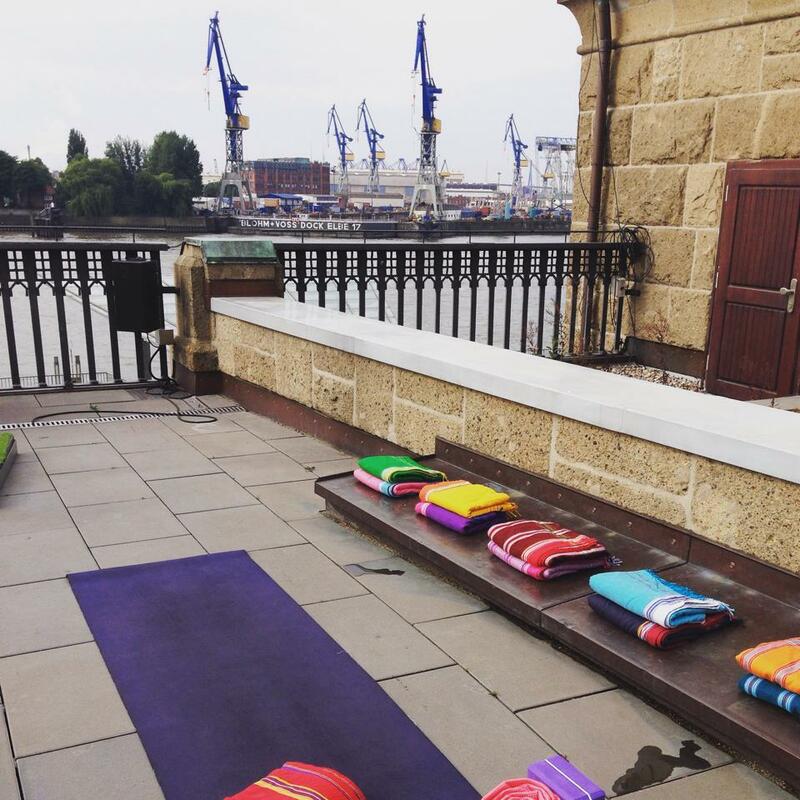 Six months ago, on August 4, 2014, I looked at this beautiful space in Hamburg and decided this was going to be my yoga studio. Two weeks later it was – mats, blocks, rolls, straps, signs and designs, everything in place. On August 16, I taught my first class there. 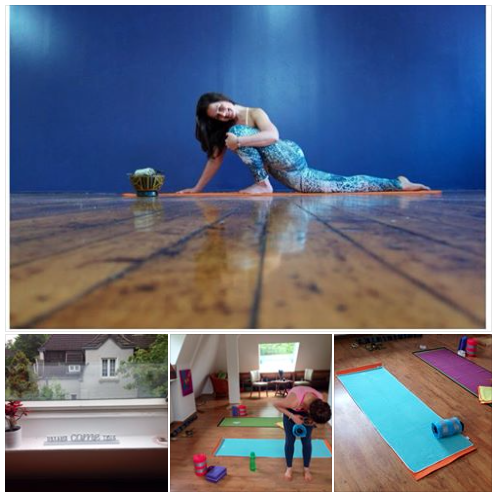 I used every opportunity and started teaching at a rehab and leisure centre for elderly, at fitness and yoga studios across the city, at the Hamburg Autonomic Women’s Shelter, and I also started my own classes in my studio space, “Kilundayoga”. And let me tell you, if anything it was t-o-u-g-h. Living off yoga is more than a challenge. But finding out how to make it work intrigued me. I always like to get it, when I can’t I keep going, looking at it from a different angle, until I find the secret door in. What kept me going through the rough first months was that I wanted to stay in this head space, on this level of consciousness and in this energetic space of giving something that I thought was worthwhile on a greater scale, for humanity. Because it did me good, too. Teaching yoga makes me feel connected with the essence of being human. It makes me feel part of humanity and not alone anymore. I see everyone as a fellow companion in this mysterious experience we call life. Sharing my tools, my experience and everything I have to offer, and seeing it doing good or being useful to others is real fulfillment to me. It’s being human on a really sweet level, exchanging compassion, gratitude and the unique sparks of everyone’s own character. I have been fortunate enough to see many wonderful sunrises in my life so far, to drink in God’s light in its rawest and purest forms, the most touching ones being in Africa – like this one you are looking at right now, Diani Beach, Kenya. My favorite place (no filter, no photoshopping) where I spent many important years of my life. The beauty I have seen cannot be described in words. It goes beyond that, it is a timeless feeling. A state of being. The light is what always guides me back to Africa. On the outside and within. And that is what I am trying to share. Following the light has become my mission; igniting light and fueling light in myself and in others. Sometimes that includes bursting some chains, shedding light into some dark places – and trust me I have bust a few chains and shed some light in ugly spots so far, and it was not always pretty, but definitely always worth it. Illuminating one’s own heart with what one’s heart most desires takes courage, honesty and effort. It is so easy to choose the safe path, the easy way out when you hit a wall. Facing what limits you and dissolving that is a hard but wonderful process, and it leaves you coming out empowered and free on the other end. It is the only worthwhile investment I see. That and helping others find the light on their own path, supporting them in shining their light. So that when the heart stops beating one day, it will be peaceful and have no regrets. We are all one, we are all connected. We are all God’s energy, tiny little particles of creation, elements made of stardust. Beautiful spirits all seeking the same: happiness and lightness. 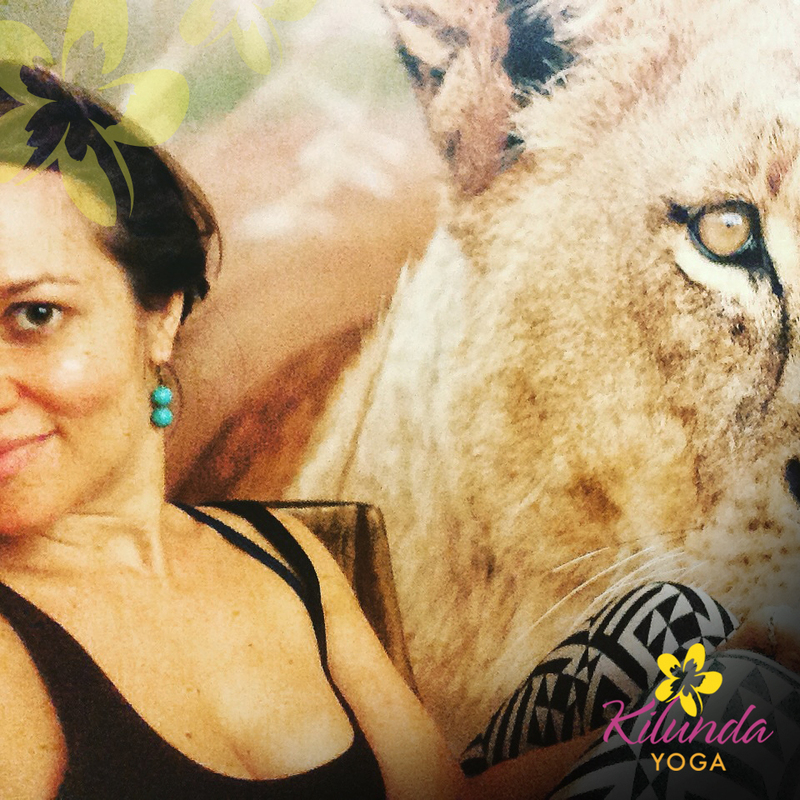 It is my mission with Kilundayoga to liberate, guide and support others on their personal path into Freedom. >>> Into the Light. Dancing spirit. Kilundayoga. Where there is Love, there is no fear. Where there is no fear, there is Freedom. May we all shine bright! Yesterday, I taught a private session to an Afghani girl at one of the Hamburg Autonomic Women Shelters for victims of domestic and psychological violence. When she started taking my classes, she wasn’t even able to close her eyes during Savasana, or open her hands, let alone holding intense poses. Yesterday, she started to expand her breath into her low back consciously and lift her chest bone, something that was unthinkable some weeks ago. She made it through all the deep ab work and she even did Downward Dog on the Wall and Dolphin on the Wall. It is incredible to see a person taking charge and finding strength in their own body. My mission is to support people on their personal path into Freedom. Awesome first (and fully booked!) 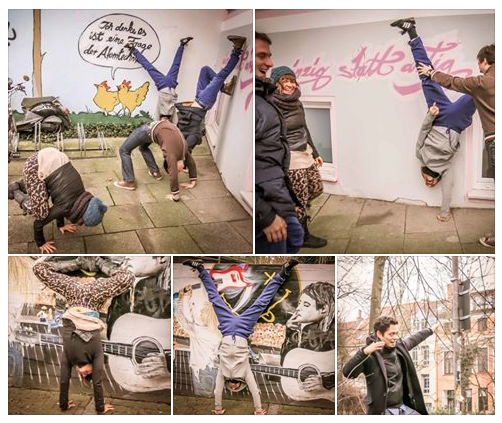 Forrest Yoga Workshop in central Hamburg last Sunday. 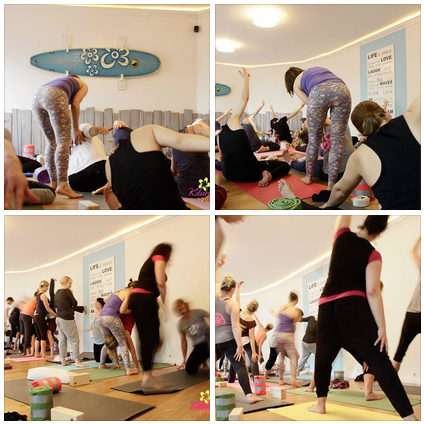 Thank you Diana, Makai Surfyoga Loft, Thank you HAMBURG! 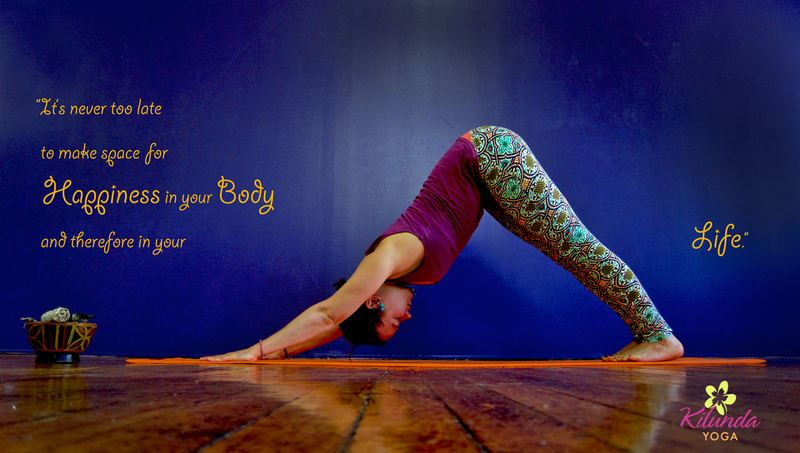 Bridge > Wheel > Viparita Dandasana > Wheel > Bridge. A little under a year ago, not even one of these poses was remotely thinkable for me. I had just jammed my L5 and sacrum and getting out of bed was a mission, sun salutations absolutely impossible and forward bending an Apex pose. I sought some physiotherapist help in order to make the flight to NYC for my first yoga “job” at the Yoga Journal Live Events. I was out of pain for 2 days and then back in pain, very much immobilised. However, I wasn’t worried, because 14 days later I would train with my teacher, Ana Forrest, for a month. I knew that what had healed my low abdomen the first time around 2 years ago was going to heal my back, because those areas are strongly connected. And so it was. By the end of the month I was pain-free. 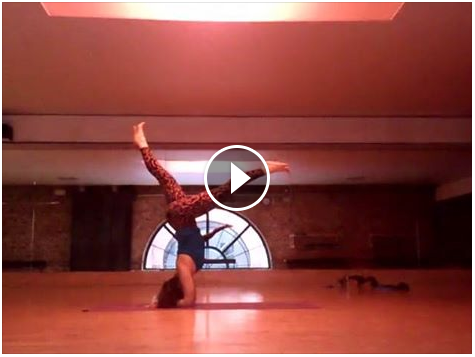 By today, I am able to do backbends to this degree, which to me is a major breakthrough. The most amazing thing about it is: the technique. Instead of straining and compressing my back it frees it up and leaves it more mobile and stronger. 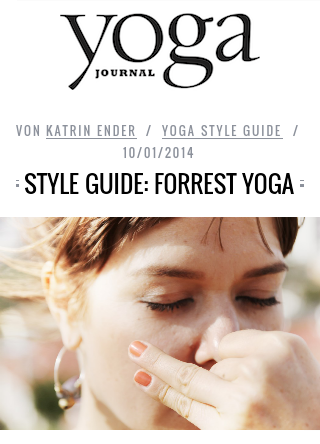 I’m so thankful for this practice: Forrest Yoga. Got inspired after my first class at Holmes Place today! Celebrating the moment and space, because Happiness is not a destination, Happiness is the way. 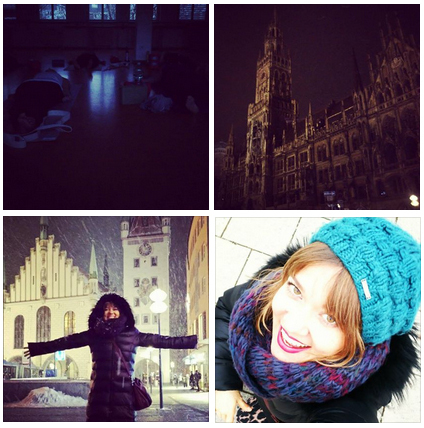 Amazing and first FORREST YOGA Workshop for HipHop and Contemporary Dancers in Munich! What fun we had exploring the wall work and expanding breath. Incredible energy at Moroder Dance Academy! 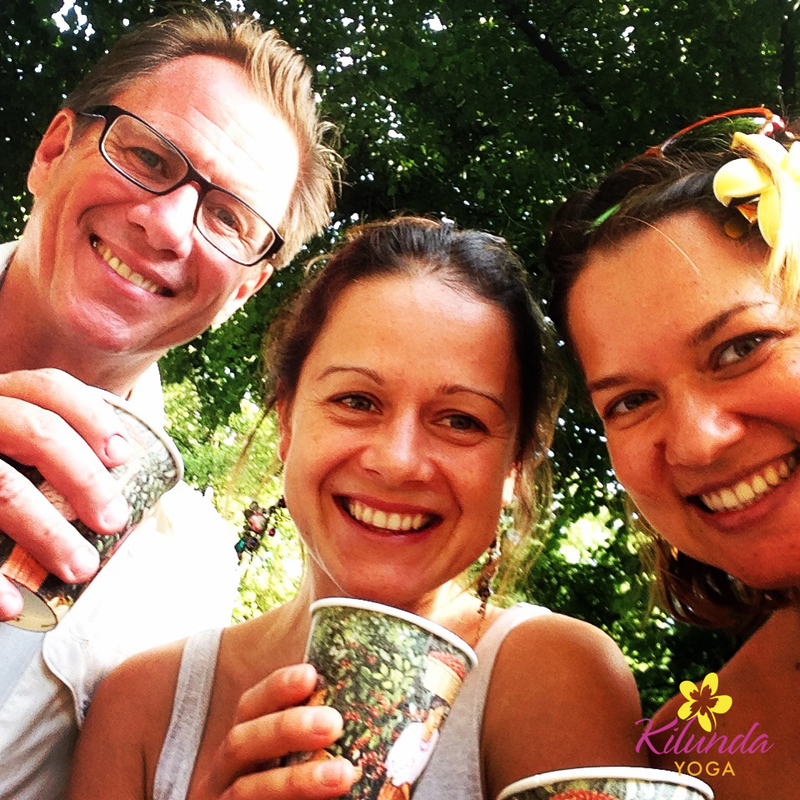 Amazing “Welcome 2015!” workshop at Kilundayoga! Full house, fully booked and full fun! Viel Spass beim Lesen! Walk in Beauty – Aho! Throughout my entire life so far, I have only one question. I know the deep despair of being homeless in my heart, disorientated growing up between the most contradictory of cultures, having lived through 3 divorces, one of which was my own, but the most tragic of all divorces was the one between me and my own heart. I never feared pain, because I always felt it brought me closer to source and truth, and pain is in many ways self-inflicted. I knew if I was working with that I could change that entrapment. There is no sugar-coating when you want to reach the core of your own being. Facing yourself is the most challenging yet most evolutionary experience. I have grown up with little and yet with the richest of things, because I had Love and an amazing family. 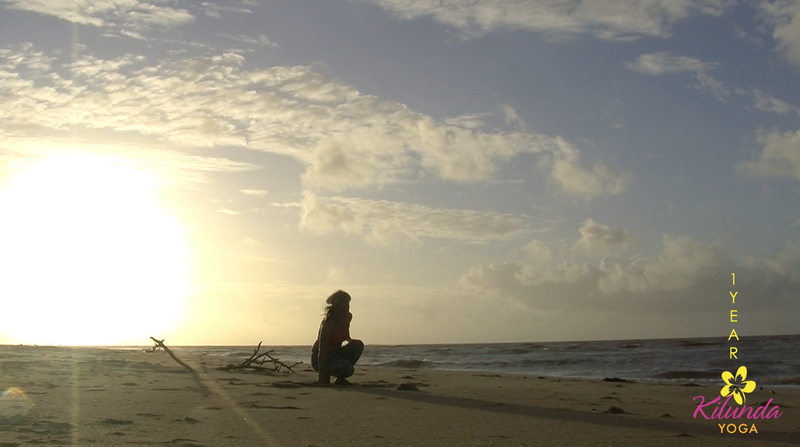 And the most beautiful of natures around me, wild and raw: the West African desert and the Atlantic African coastline. I carry that seed within me always, and even when I am very far away from that beautiful land the leaves of the bushes and trees and the wind that brushes through the desert caress my soul. My skin is the colour of the sand I played in when I was little, the dunes outside our house which carried sea shells millions of years old kept wandering closing all possible man-made-passages dug into the sand to allow cars to pass. Only the ones able to ride a motorbike cross country or a horse would be able to get through to where I lived when I was a child. In my adult years I have lived with the northern Iraqi people up in the mountains of Kurdistan shooting a feature film about domestic violence against women and arranged marriage in the Middle East, a topic I consider very important – it is just another expression of what I feel we humans tend to do => be drawn towards destructive patterns of behaviour intended to create an illusion of control of our own life and of the lives of others around us. Three years ago my illness has shown me that even when you have very little to rely on, like in my case only my own body, that can change. All matter can fall away. Clinging to material things reduces your sense of motion and Freedom in your life. The only true Freedom is the Freedom the soul. Yoga taps into the most original of sensations, it leads you back to your own source, the one that is not in your mind, not in your ego, not in any body parts. It’s what is left over when the observer stops observing and all else fades away. From my very early years, I have followed one path, even though my path seems to be all over the world and leading into so many different terrains in all kinds of ways. I am guided by one question. And the answer to that question cannot be answered by “Yes” or “No”. In fact, I do not acept Yes or No as answers. The only question that drives me in my Life is “How”. A Yes doesn’t mean the solution to any problem, nor is it a guarantee for happiness. What matters is How the experience is, whether or not it makes you and your entire body say Yes. A Yes can also mean an entrapment, so reflect on the How even if the Yes feels good. A No, whether in your thoughts, heart, or entire body, does not need to remain a No, it can become a Life-embracing Yes that frees you from within and allows happiness in your life. That is if you reflect on the No and ask yourself: “Why not?” And most importantly: “How”? How can I get the situation to change in a positive way, in a way that serves me. The conscious process is important, but the action following that is crucial and the determining factor in life. Rules are the easy way out for the ones who choose compromise, satisfaction within the boundaries of a comfort zone. “How” is the key to the path of the creative warrior, the one who dares to create their own parameters and takes on responsibility for their own pain and thus happiness. This picture of me was taken at 13 years old during a time I was traveling back and forth between Egpyt and Germany after having left Sénégal and before moving to the USA. It reminds me of the character I played in Iraqi Kurdistan: beloved “Viyan”. The film, One Candle Êk Momik, Du Momik – The movie One Candle, Two Candles is currently screening in Vancouver, Canada. My life is now comitted to alleviating any sort of pain by choosing a life that is pain-free and/or working and living in a pain-freeing way on a physical, emotional and spiritual level; and helping others who may want that for themselves, too. Stay connected to your source and when you are not, reconnect. May all living beings on this earth experiencing this experience we call life be happy, wild, and free. May Kilundayoga do its share to help lead people back to source. 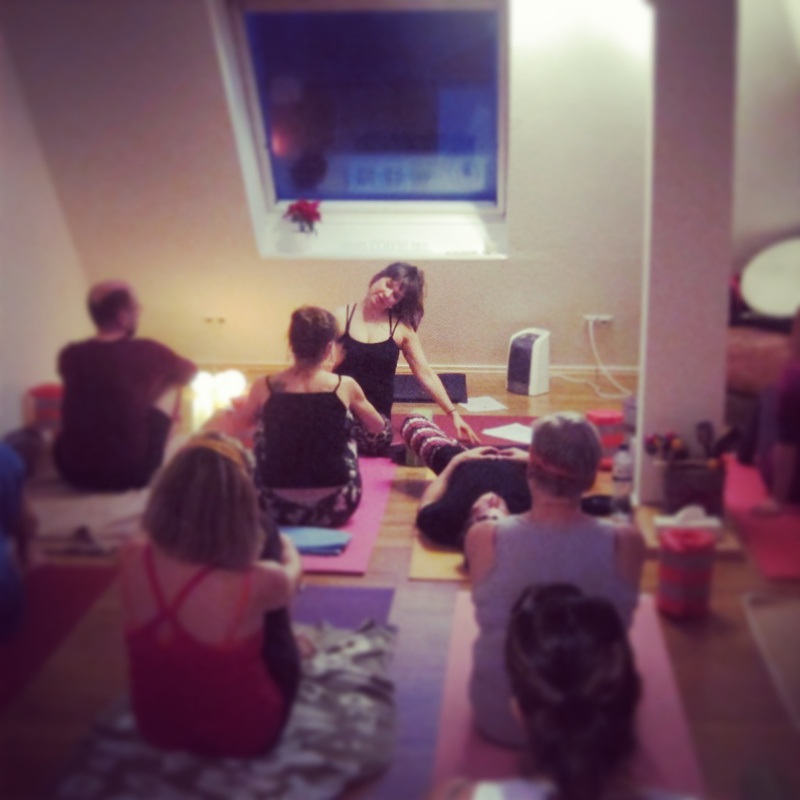 On this very balanced day of “Four”s, with the kind help of the Powers of the Four Directions from Native American Medicine which we use in Forrest Yoga, with great joy and in deep gratitude to my teacher Ana T. Forrest and her incredible work and living example, I am proud and happy to announce the opening of Kilundayoga Studio Hamburg. 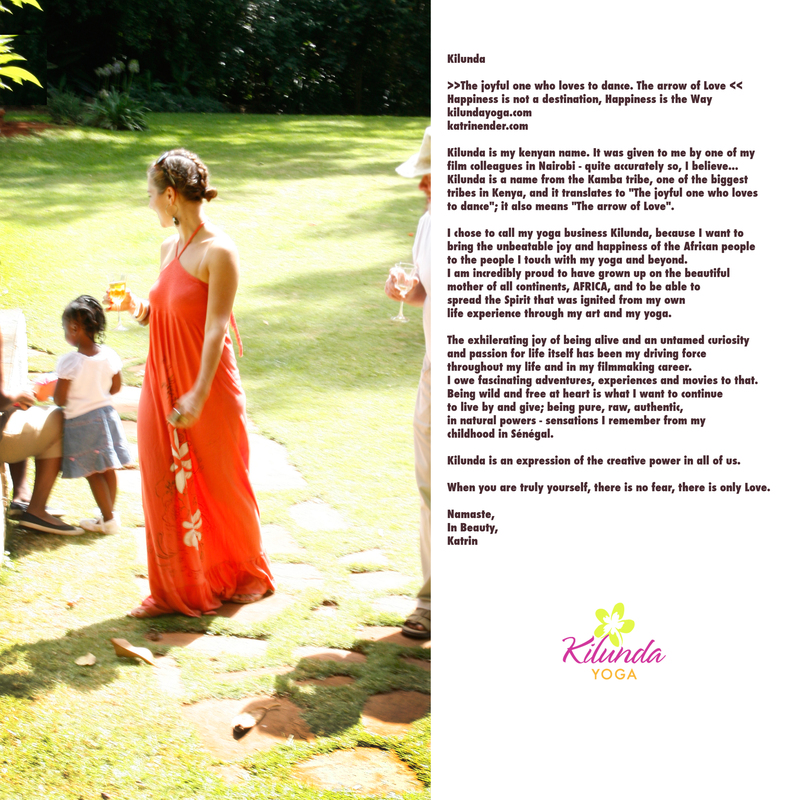 May it blossom, may it bring healing, playfulness, freedom, happiness, love and brighten spirits, just like Kilunda. Namaste. Asante. Danke. 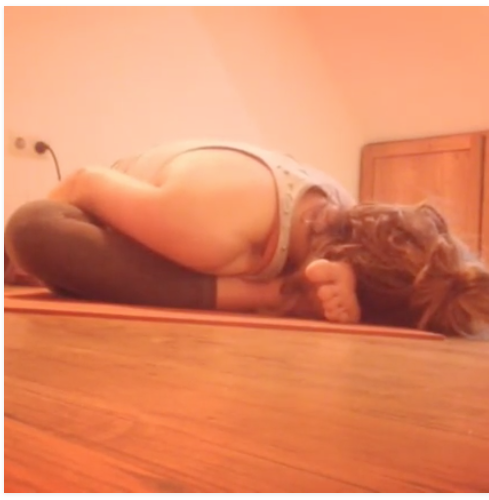 Six weeks ago I started the Forrest Yoga BackBend movement #fyB52 – – 52 therapeutic backbends, one every week of the year – – This sequence below documented on week 7 shows various Forrest Yoga moves following one another: Cobra Over The Roll > Bow Over The Roll > Bow Over The Roll One Leg and One Arm Straight. These are some of the poses I healed my back injury with. Read more here. Today marks an end and a new beginning. And here’s why I did this…. Part of “Walking in Beauty” (which is the concept of Forrest Yoga) is to have fun, to feel empowered and to be OK with facing your fears…. 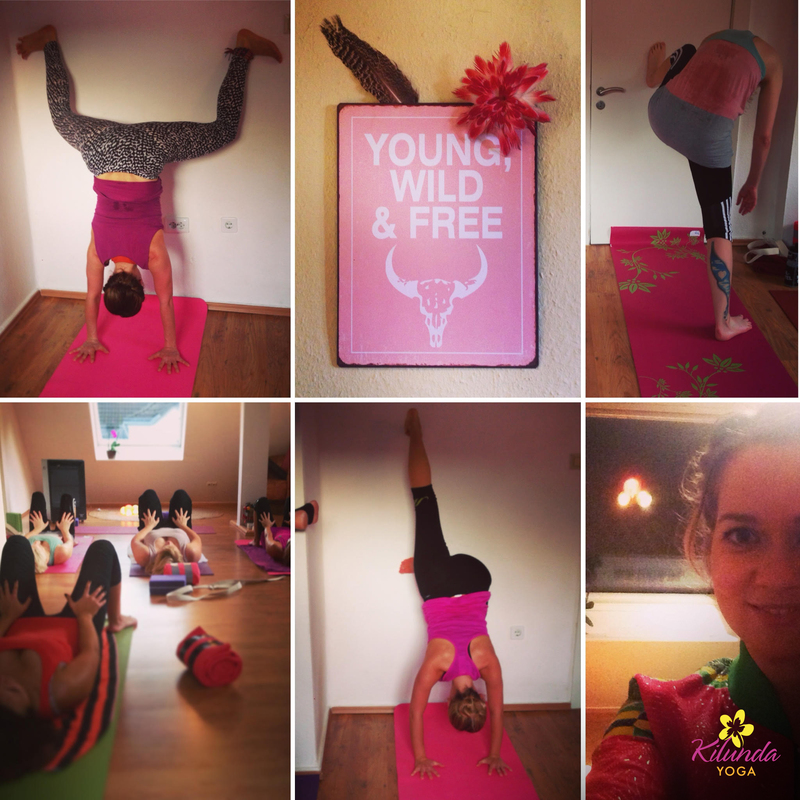 so Forrest Yoga came up with the #fyhandstand challenge to cover all of those things off in one go. Well, 365 x one go to be exact. 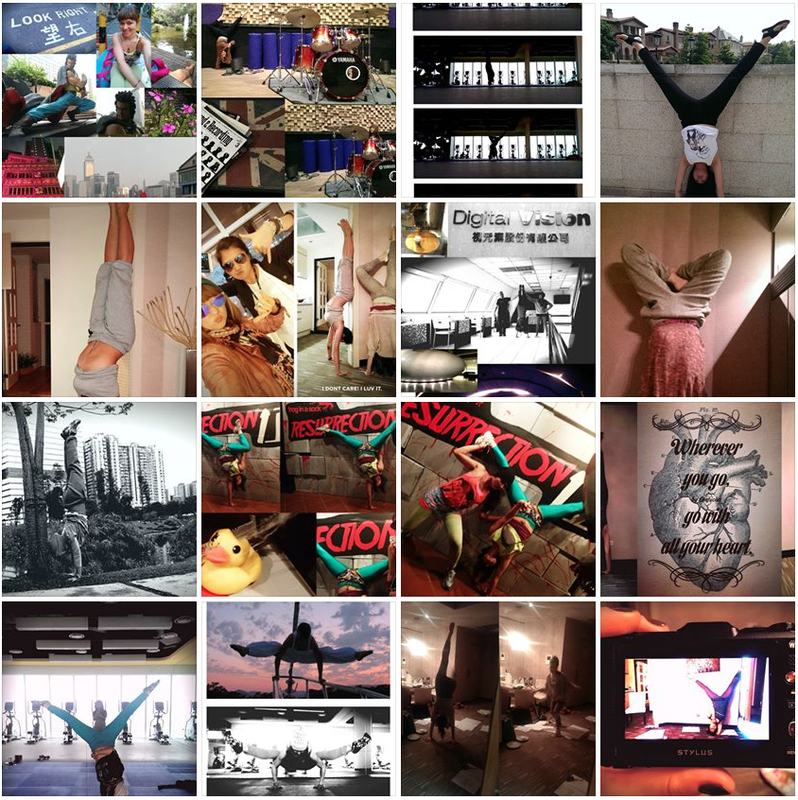 Join us and do a handstand, down dog at the wall, forearm balance or dolphin at the wall every day for a year (basically, an inversion that takes you to your edge, there’s something for everyone!) 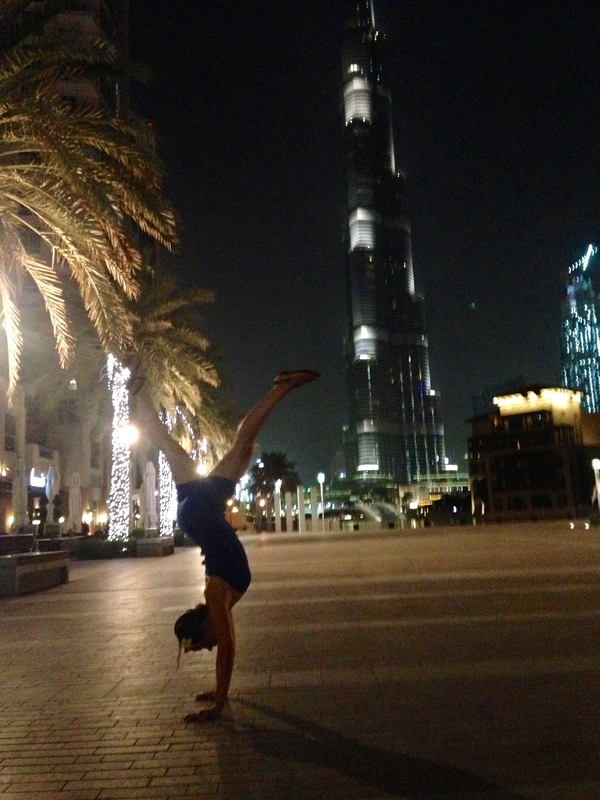 You don’t need to be good at handstand or a long-time yogi, just have fun! Get playful upside down, change your perspective! 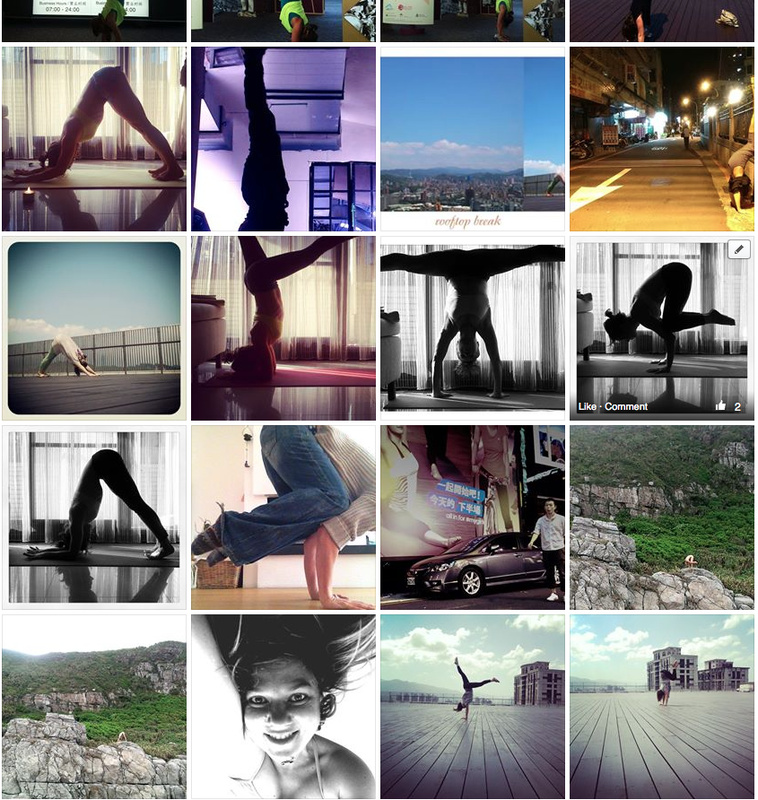 Post pictures via instagram with the #FYhandstand365 tag, share your journey, and get inspired! If you have a fab shot that you would like to share, I would love to see it, please send it to me! I will be adding shots of myself that I think are worth sharing and your best shots into this album along our journey. 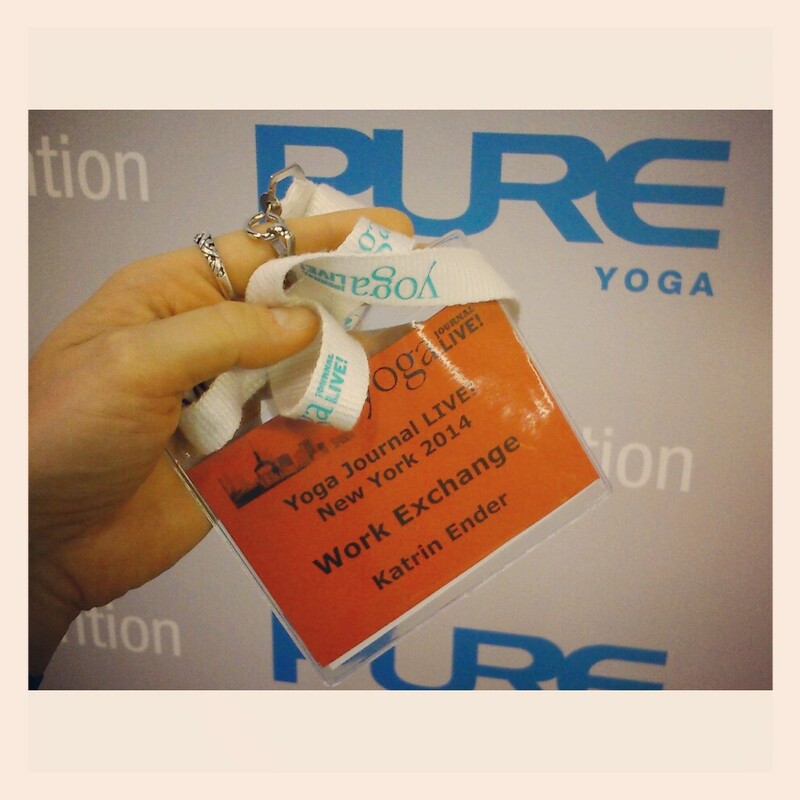 I had the great honor to volunteer at the NYC Yoga Journal Live! Events and learn from some amazing teachers. I also felt very proud to meet and serve the yoga community of North America and found some wonderful friends and spaces. 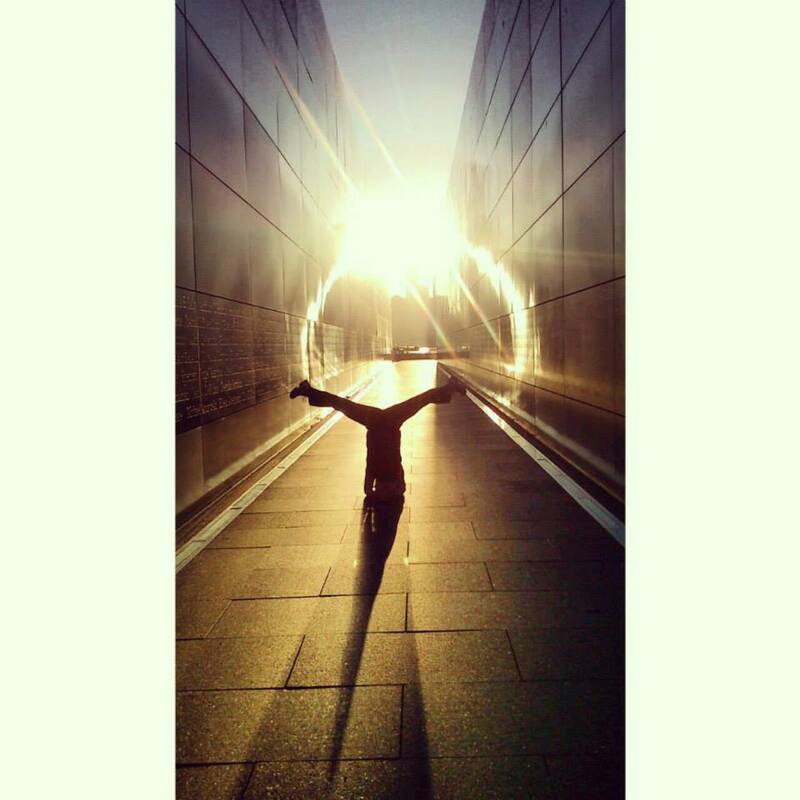 #fyhandstand365 day 332 – Early morning run, 6:30am Lower Manhattan sunrise, 9/11 memorial, running off my jet lag at Empty Skies Memorial, Liberty State Park. First time grabbing my foot, thanks to some fantastic advice by my friend and yoga teacher colleague Angela. In an underground metro station in Xindian district, New Taipei City, home at this time. 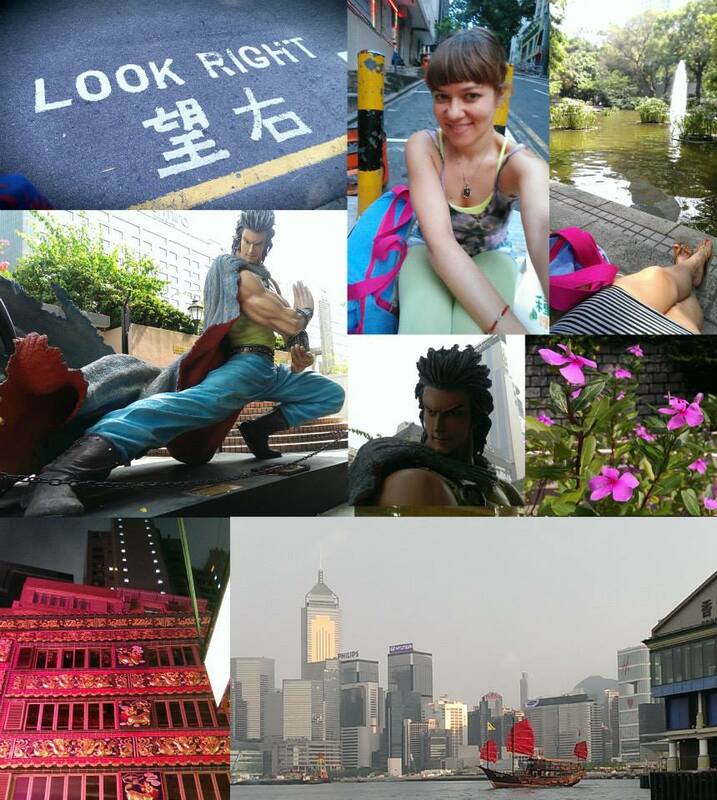 On my way to Hong Kong to train with Ana T. Forrest. I have been fortunate to be able to join Ana’s Teacher Training this week in Hong Kong, and besides the amazing gifts I will receive during my own practice under her guidance I am very much looking forward to the opportunity of expanding my experience as a Yoga teacher who wants to be relevant to people’s lives in today’s realities. Since I have chosen my stay in Taiwan to be testing my foundations and solidifying my new approach to some aspects of life what matters to me is that my teaching is real and relates to the lives of the people I teach Yoga to. Putting my own body, mind, and soul through a non-yogic reality, the corporate reality in a high-pressure environment such as advertisement and film production, helps me to precisely understand the needs and requirements one living this lifestyle has and thus shape my teaching accordingly. So far, my experience has been incredibly insightful. Whilst being challenging, it has allowed great growth to happen. I am thrilled to have discovered new, valuable teachings in traditional chinese medicine and Kung Fu, which seem enriching, creating a strong desire to be explored more. Thankful for this opportunity. Namaste. On the day that I landed in Germany, a transformed person after my Forrest Yoga teacher training, having traveled more than 24 hours I stood on one arm for the first time. I didn’t think this was possible. Especially remembering where I was 4 months ago. 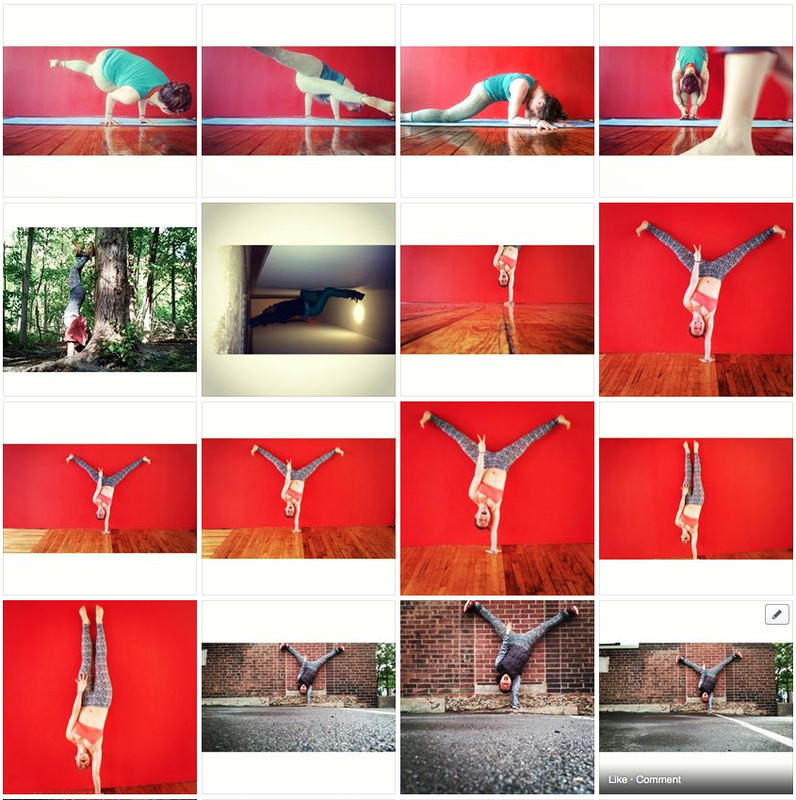 I joined the Forrest Yoga movement #fyhandstand365. This is day 63 and my favorite picture of this year. 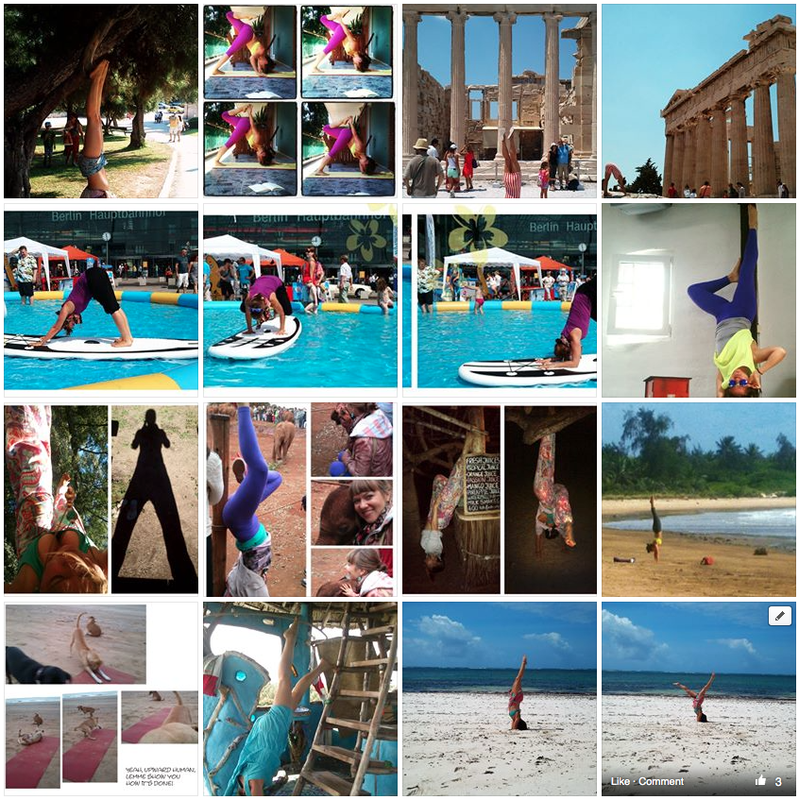 It was taken in Athens, Greece, during my Kilundayoga Blue Cruise test phase in Turkey. Another dream come true. I am so humbled and touched. Being mentioned on Ana Forrest’s official Newsletter is such an honor. Thank you, for your support, for your incredible Love. I am speechless. Thank you, Thank you, Thank you! This to me shows yet again that “Whatever you do out of Love has a Future.” My commitment to this magnificent practice, life style, way of being is stronger than ever. Healing waiting to be given. After teaching in South Africa I am currently undergoing further training in Germany. 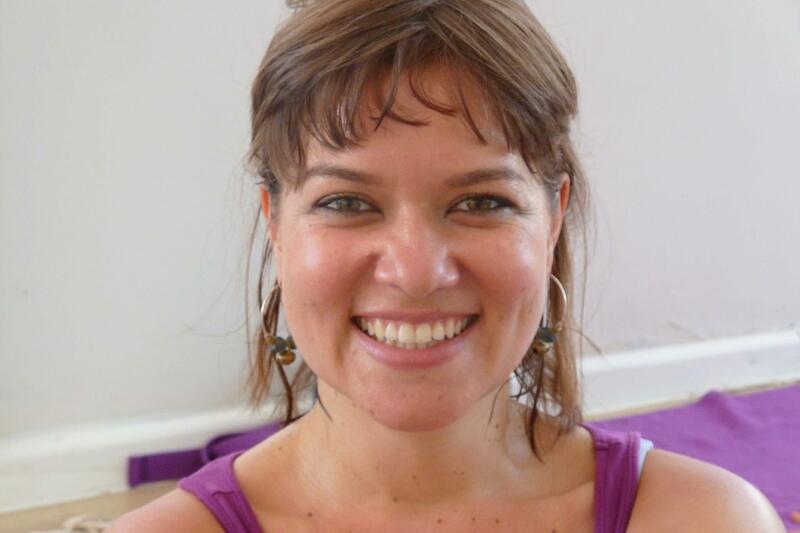 During my Forrest Yoga Teacher Training in Cape Town, South Africa. Underwater Yoga. My love for scuba diving developed because of the sense of Freedom I felt breathing underwater. That sensation of Freedom grew when I started to master my buoyancy. 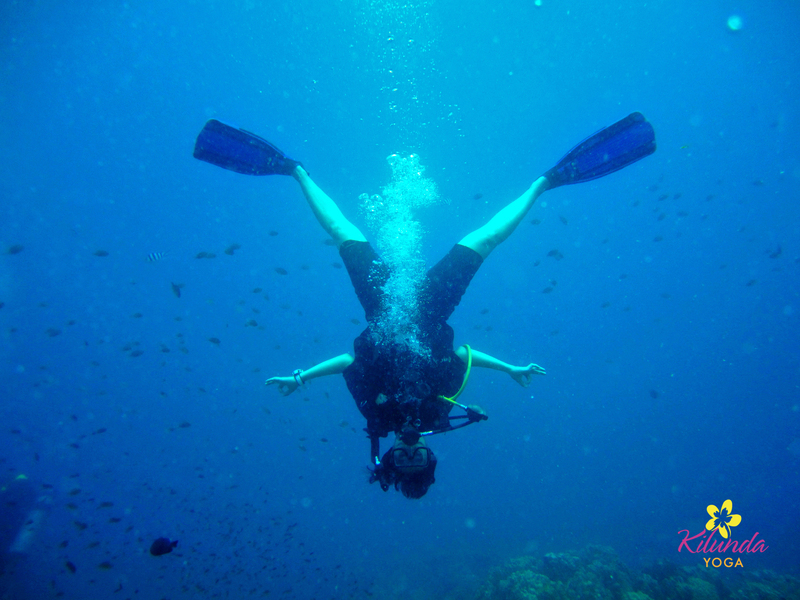 Teaching yoga to scuba divers has been my dream since I learnt scuba diving. Opening the body with breath and meditation before diving enhances your experience underwater. You see more, you connect more, you feel more. Expanding the breath and learning how to deliberately apply various breathing techniques also allows you to stay under water longer. Being underwater is like being in the womb. The environment resembles a space in meditation, when one travels to a time before one’s own conception. It’s a very spiritual space. And finally, the underwater puts your mental strength to the test and allows you to practice working with fear. You learn how to overcome panic through the control of your mind. That is why to me, Yoga and Scuba Diving are practices that enhance each other.